Graduation of His Royal Highness The Crown Prince Tupoutoa-Ulukalala from the Australian Command and Staff College, Canberra. 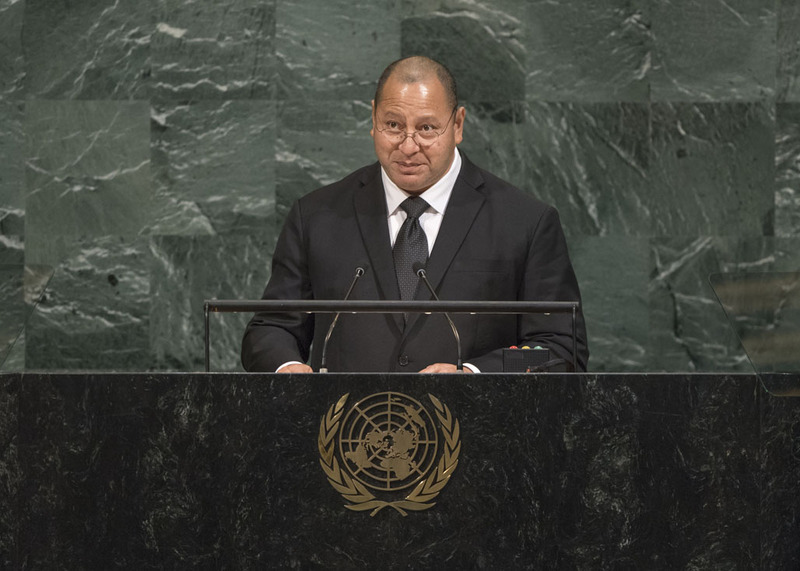 Tupou VI, King of Kingdom of Tonga, addresses the general debate of the 73rd Session of the General Assembly of the UN (New York, September 25 – October 01, 2018). Ha'apai school children performed Tutupakanava ritual as part of their offerings for His Majesty King Tupou VI's birthday celebration. 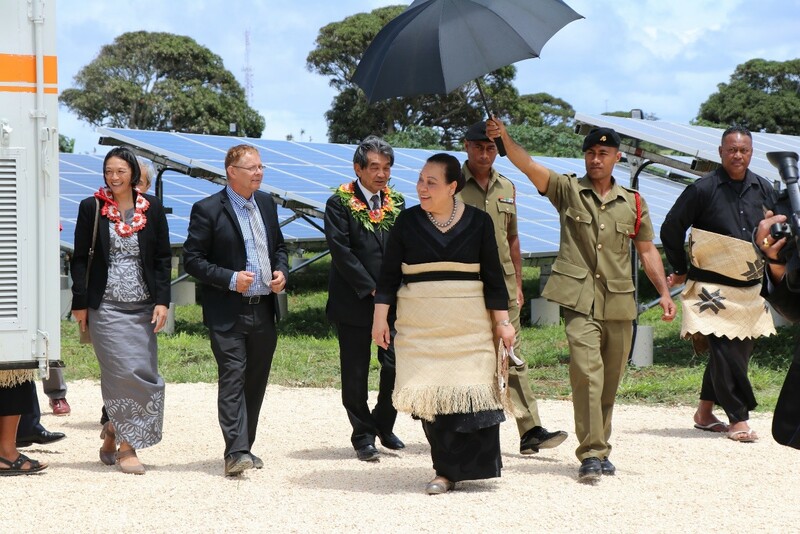 HM King Tupou VI, accompanied by Queen Nanasipau'u, officiated the commissioning of the Matatoa Solar farm on October 17. A follow up to the December 2016 trip to Thailand was conducted April 5th through 15th 2017. The delegation consisted of the project’s five core members. The study visit to Thailand in December 2016 sponsored by the Thailand International Cooperation Agency (TICA) enabled eleven participants to observe and learn the applications of the Philosophy of Sustainable Economy (SEP). His Majesty's Armed Force's Navy Patrol Boat VOEA SAVEA set sail from Niuatoptapu for Tongatapu via Vava'u on 20 February 2017, on board was His Majesty King Tupou VI returning from a Royal visit to the island of Niuatoputapu. His Majesty King Tupou VI and HM Queen Nanasipauu, at the invitation of the Commander of the Australian Defence College Maj General MB Ryan MB, visited Canberra for the 2018 Australian Command and Staff Course (Joint) Graduation Ceremony on Friday 7th December 2018. His Royal Highness along with his fellow course members of 172 from 24 countries graduated with the passed Staff College (Joint) qualification [(psc(j)], along with a postgraduate qualification in Military and Defence Studies accredited from the Australian National University. His Royal Highness The Crown Prince Tupoutoa-Ulukalala in addition to receiving the psc(j) qualification was also awarded the postgraduate qualification of Master of Military and Defence Studies (MMDS). 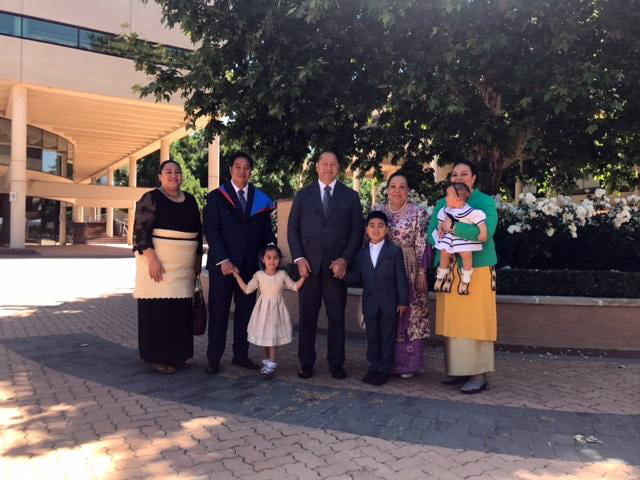 Also present at the Graduation celebrations were Their Royal Highnesses Crown Princess Sinaitakala, Prince Taufaahau Manumataongo, Princess Halaevalu Mataaho, Princess Nanasipauu Eliana and; Her Royal Highness The Princess Angelika Latufuipeka the Tonga High Commissioner to the Commonwealth of Australia. Their Royal Highnesses The Crown Prince Tupoutoa-Ulukalala and Crown Princess Sinaitakala and the Royal children will return to Nukualofa for the Christmas Holidays before returning to Canberra in the New Year where The Crown Prince will pursue further studies at the two year Master of Diplomacy course at the Coral Bell School of the Australian National University. 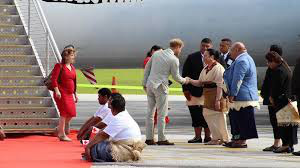 Their Royal Highnesses The Duke and Duchess of Sussex were warmly welcomed by Her Royal Highness The Princess Angelika Latufuipeka on their arrival at Fua’amotu International Airport on Thursday afternoon. 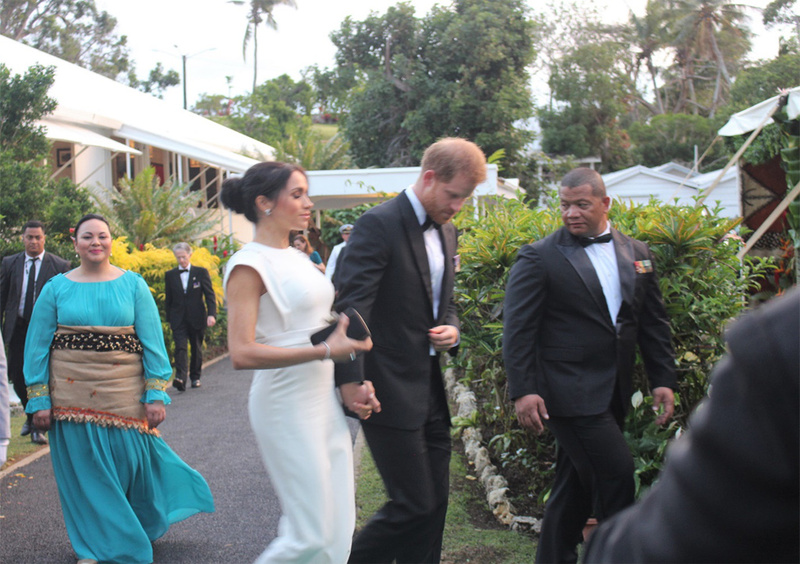 Their Royal Highnesses were escorted to 'The Villa Royal Residence' before proceeding to a private audience with His Majesty King Tupou VI and HM and Queen Nanasipau’u at Consular House. Following the private audience, The Duke and Duchess attended the Official Welcome reception where Their Royal Highnesses met with invited guests including other members of the Royal Family, Nobles of the Realm, Cabinet Ministers, Diplomatic Corp, Church Leaders, Government senior officials, Officers of His Majesty’s Armed Forces, People’s Representatives and members of the business community. The Duke also conveyed a message from his grandmother Her Majesty Queen Elizabeth II: "Your Majesties, it gives me great pleasure that my grandson and his wife are visiting the Kingdom of Tonga. "Our two families have enjoyed a deep and warm friendship over many years, and I hope that our close relationship continues with the next generation. "To this day, I remember with fondness Queen Salote’s attendance at my own Coronation, while Prince Philip and I have cherished memories from our three wonderful visits to your country in 1953, 1970 and 1977." 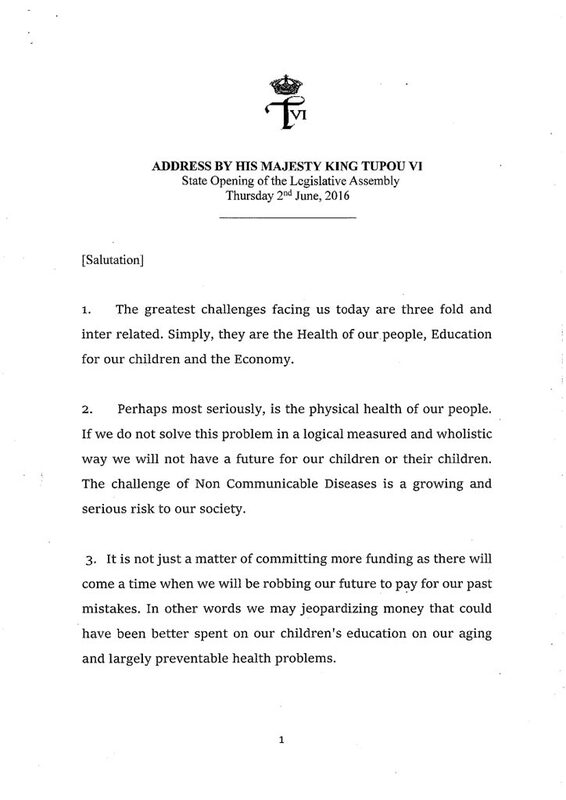 "In the months and years ahead, I wish Your Majesties and the people of Tonga every good fortune." Following the evening's welcome reception and Royal Dinner, His Majesty King Tupou VI, Queen Nanasipau’u and Their Royal Highnesses The Duke and Duchess of Sussex, The Princess Angelika Latufuipeka and Princess Ofeina ehe Langi Fakafanua presided at the Traditional entertainment provided by Kolovai Estate with the performances of the Fa'ahiula, Me'etu'upaki, Ta'olunga and Lakalaka. On Friday 26th October 2018 was a courtesy meeting with the Prime Minister, Hon. 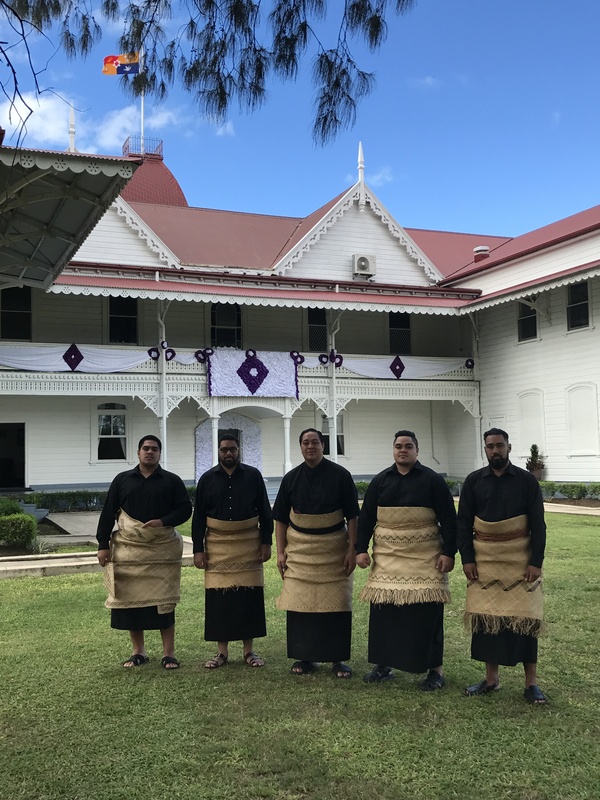 Samuela ‘Akilisi Pohiva at the St George Government Building before proceeding to an Exhibition hosted by Her Royal Highness The Princess Angelika and the Tonga National Youth Congress at the Fa’onelua Convention Centre. Their Royal Highnesses also viewed a vibrant range of Tongan handicrafts, local produce and Tongan entertainment outside the Convention Centre before visiting Tupou College to dedicate the Tonga projects of the i) Toloa Forest Reserve and ii) the Eua National Park Reserve as part of the Queen’s Commonwealth Canopy Initiative to save the World’s Forests. The Royal Visit ended with a farewell audience at the Royal Palace with His Majesty King Tupou VI and HM Queen Nanasipau’u before Their Royal Highnesses departure for Sydney, Australia. 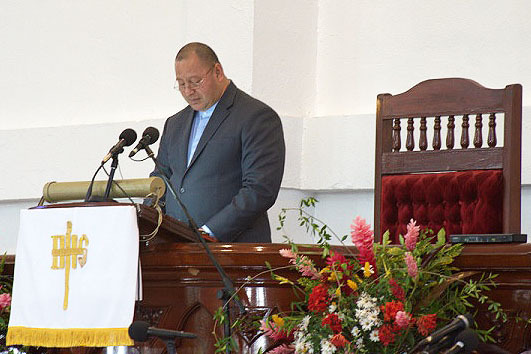 His Majesty King Tupou VI in Audience with H.E. Saleh Ahmed Alsuwaidi, conveying through His Excellency, His Majesty’s best wishes and compliments to His Highness Sheikh Khalifa bin Zayed Al Nahyan and reaffirming the Kingdom of Tonga’s close relations with the peoples and Government of the United Arab Emirates. A number of bilateral issues were discussed including the setting up of the Tongan Embassy in Abu Dhabi and the appointment of Honourable ‘Akau’ola as Ambassador Designate to the United Arab Emirates and Gulf Cooperation Council Member States. 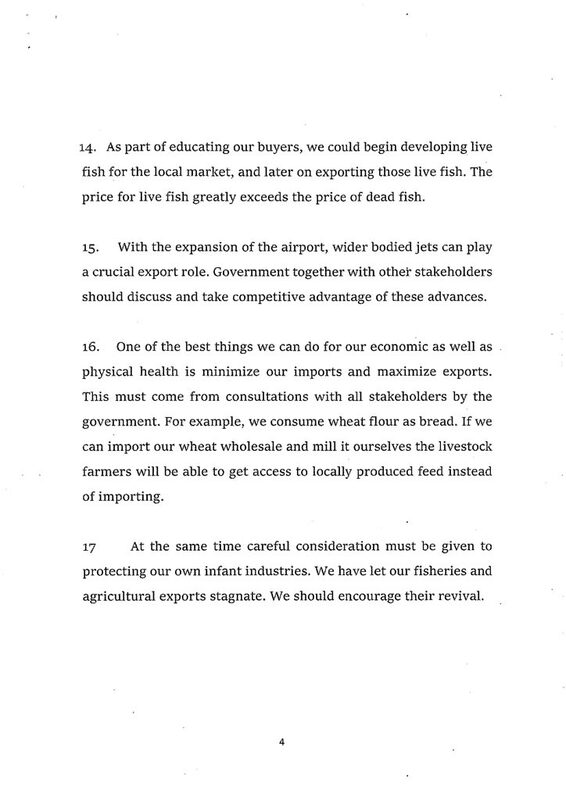 Development assistance to be considered was also presented by His Excellency in the areas of Health and Education as well as a number of visits to be facilitated to the Private Sector in Agriculture and Fisheries at the Gulf Food Expo to be held in Dubai in February 2019 to assist the Kingdom of Tonga in its preparations for EXPO 2020. His Excellency the Ambassador further provided the following release for His Majesty’s pleasure. I’d like to start this article by quoting from the President of the United Arab Emirates, His Highness Sheikh Khalifa bin Zayed Al Nahyan; "the UAE will continue to pursue its cultural cooperation with other countries towards supporting the rights, fulfilling justice and building bridges of friendship and cooperation between different countries of the world to achieve global peace and prosperity. The UAE adopts a special method with respect to foreign aid, implementing the concept of sustainable development for the good of all humanity, believing in the importance of collaboration among the countries of the world to overcome challenges. Therefore, the UAE has made sure to be an active member of the international community in the field of channelling foreign aid based on the priorities set out by international development organizations in a way that is aligned with its objectives; fighting poverty, illiteracy and enhancing growth, prosperity and peace around the world, cooperating closely with governments of friendly developing countries in a form of constructive bilateral partnerships to achieve their national development plans and sustainable goals. For the fifth consecutive year, the UAE has preserved its ranking among the top international donors in 2017 according to the statistics announced by the Development Assistance Committee of the OECD, with donations reaching $5.3 Billion covering 147 countries around the world. This global profile as one of the largest donor country is the result of the legacy which was instilled in our hearts from the founding father of the UAE, the late Shaikh Zayed, who infused the "Emirati culture of giving” in society and current leadership of the UAE. This year marks the eighth anniversary of the visit of His Highness Sheikh Abdullah Bin Zayed Al Nahyan Minister of Foreign Affairs and International Cooperation to the Pacific region, specifically to the Kingdom of Tonga and the Republic of Fiji in 2010, during which he laid with the Governments of the Pacific, the foundation for the existing partnership between the UAE and the Pacific taking the UAE-Tonga relations to an advanced stage with achievements made in several areas including political, economic, and social cooperation despite the geographic distance. One of the most important results of this partnership is the establishment of the UAE Pacific Fund with $50 million US dollar value which funded and delivered 11 renewable energy projects in the Pacific region with a total capacity exceeding 6 megawatts to meet the needs of the islands’ people, reducing CO2 emissions equalling 8447 tons and saving millions of dollars instead of buying diesel to generate power. The Abu Dhabi Future Energy Company (also known as Masdar) installed power plants in cooperation with other partners and in addition to organizing courses and workshops to enhance skills of engineers, and officers in charge in the Pacific countries. Among remarkable lessons of this, is that the partnership taught us that cooperation is paramount to overcome challenges and to open new horizons for the people of both regions. This initiative played a vital role to stimulate knowledge and technology in the fields of environment and climate change. The distinct partnership between the UAE and the Pacific has become a model for other regional partnerships the UAE has extended in Africa and the Caribbean. The last Nuku'alofa Network Upgrade Project of the UAE contribution of US$3.5 Million towards developing the electricity network in the Capital NukoAlofa, in cooperation with New Zealand and the Asian Development Bank came as an expected result to the progress in the bilateral relations between the Kingdom of Tonga and the UAE amongst many others areas. The UAE looks forward to Tonga’s active participation in the coming Expo2020 to be held in Dubai, and for the first time in Expo 2020’s history, each Pacific country is dedicated an individual pavilion to present and market their products, economy, and beautiful history and culture. 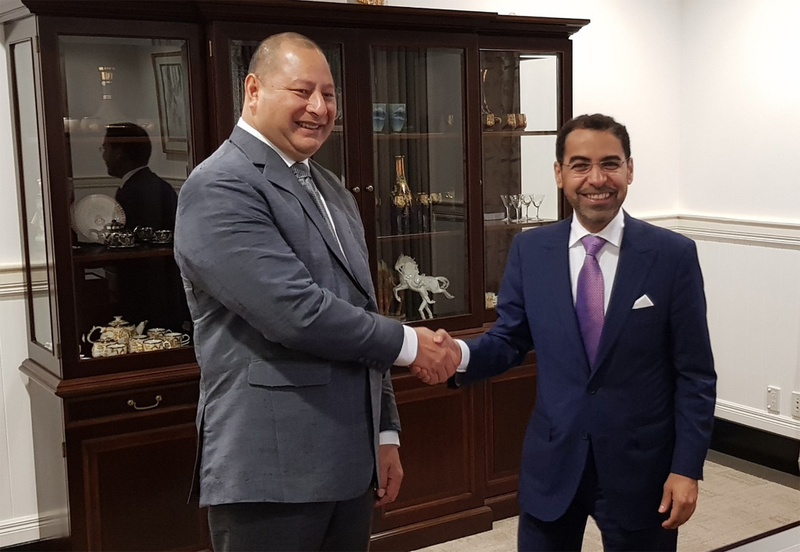 The UAE government welcomed the decision of His Majesty King Tupou VI to appoint Honourable 'Akau'ola as a Special Envoy of the King of Tonga to the United Arab Emirates. It also welcomed the Tongan Government’s decision to establish an embassy in Abu Dhabi. It is considered an important step towards building stronger ties with the UAE which has become a key trading and investment hub in the region and globally. Further, It is the best way to prepare for the upcoming Expo 2020. These positive development in bilateral relations embodies the awareness and vision of the prudent leadership of both countries and the significance of this partnership, which will certainly be to the advantage of governments and people of the two friendly counties. Indeed the Tongan UAE relationship is a living example of UAE-Pacific partnership. 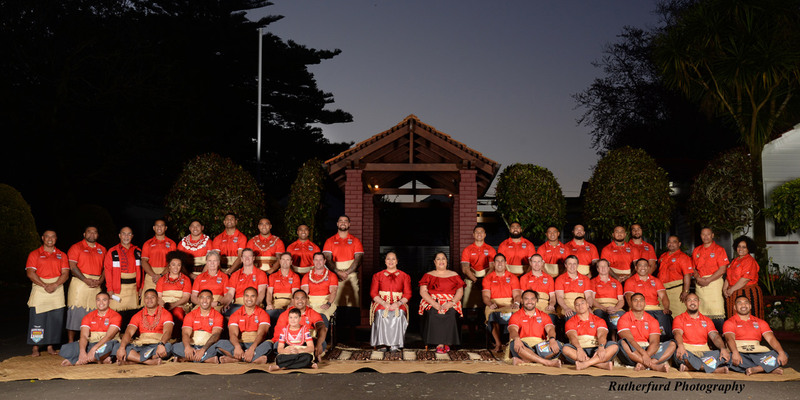 His Majesty King Tupou VI, in audience on Thursday 18 OCTOBER, greeted the Mate Ma’a Tonga team at the Royal residence in Auckland. His Majesty, a former Naval Commander knows only too well that a few words spoken can be an inspiration and lift the spirits of the team whilst they carry the hopes of the people of Tonga in the Kingdom, and Tongans living in New Zealand, Australia and around the globe. His Majesty personally conveyed to the MMT that "The country stands with you. We all stand together, very proudly… we must continue to inspire our country, our friends, our relatives and our fellow athletes and especially our youth who now see potential in what you have demonstrated through physical discipline, training, sacrifice and our Tongan spirit." This was met by rapturous applause of humility, gratitude, respect and , of course, Tongan pride for His Majesty’s inspirational words. Present at the audience was HRH Princess Angelika and Hon. Salote Maumautaimi. The team were introduced to His Majesty by Stan Moheloa (Chairman of the Tongan National Rugby League Committee) Talking Chief, Pakilau-o-Aotearoa conveyed on behalf of the team, that they will "do their best, as Mate Ma’a Tonga is our motto". HM King Tupou VI, returning from the United Nations General Assembly, New York, stopped in Dubai, United Arab Emirates. 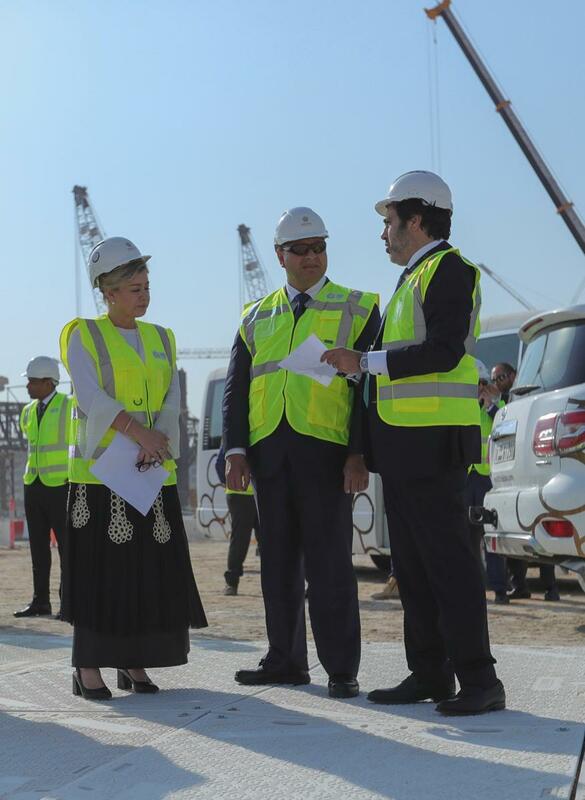 During His Majesty’s stop over, an invitation was extended by Her Excellency Minister Reem Al Hashimi (Minister of State for International Cooperation & Managing Director EXPO 2020) to visit the site of EXPO 2020. His Majesty was warmly welcomed by Her Excellency Minister Reem and the top executives of EXPO 2020 and prior to the site visit were able to discuss issues of mutual interest. This included the development of trade opportunities for high yield goods such as fisheries, agriculture and possible further investments in infrastructure like the Vava’u Solar Plant, which was wholly funded by the Government of the UAE. Possible investment in tourism infrastructure (Hotels and Resorts) was also discussed, with Her Excellency remembering fondly her visits to the Kingdom and the friendliness of the people and beauty of the Kingdom’s islands. His Majesty conveyed His wish that EXPO 2020 could be the catalyst for youth development and opportunity in education and cultural understanding. The quickly changing global political climate was extensively discussed whereby the need for strong alliances outside of inter regional relationships needed to be further developed. To this extent Her Excellency thanked His Majesty for the strong support and assistance for the United Arab Emirates in winning the bid for EXPO 2020, as well as Abu Dhabi winning its bid as headquarters for the International Renewable Energy Agency (IRENA). His Majesty was able to convey on behalf of His Majesty’s Government the gratitude for the quick and kind assistance for the US$ 3.5 million grant aid to support the electricity infrastructure rebuild to the villages, following cyclone Gita. In closing, Her Excellency reaffirmed the special relationship between the two Royal Households and the peoples of the United Arab Emirates and Kingdom of Tonga. Following the bilateral talks, the EXPO 2020 Participation Agreement was signed in the Majlis in the presence of His Majesty King Tupou the VI. His Majesty signing the Royal VIP EXPO Guest Book in Arabic as a gesture of the close cross cultural friendship between the Kingdom of Tonga and United Arab Emirates. His Majesty inspecting the prime Tonga Pavilion site that had been previously negotiated, in the Opportunities Sector. This will be the first time Tonga has a standalone Pavilion at a World EXPO. His Majesty King Tupou VI, with Omar Shehadeh [Senior Vice President International Particpants Operations and Mrs Sue ‘Akau’ola discussing strategic plans for the Tonga Pavillion. I congratulate you on the assumption of your presidency of the 73rd Session of the United Nations General Assembly. I assure you that the Tonga delegation will fully support your able leadership. I express our gratitude to your predecessor, His Excellency Mr. Miroslav Lajcak, for his successful and able leadership of the Assembly at its 72nd Session, in particular making the work of the Assembly be people-centered, by striving for peace and a decent life for all, on a sustainable planet. I also commend His Excellency Mr. António Guterres for the ongoing stewardship of the Secretariat. Tonga fully supports the ongoing work he is undertaking on reform, including the all-important review of the United Nations multi-country offices in the Pacific Islands region. My delegation and I congratulate you also on your theme as being both timely and relevant. "Making the United Nations relevant to all people: Global leadership and shared responsibilities for peaceful, equitable and sustainable societies” aptly reflects who we are as a collective, ensuring the work of the United Nations has meaning to those that matter most – our peoples - and we welcome your theme as the guiding principle for our work this session. In contributing towards the implementation of the 2030 Agenda for Sustainable Development and its sustainable development goals (SDGs), including the internationally agreed blueprint for the sustainable development of small island developing States (SIDS), the SAMOA Pathway, Tonga has made both Agreements an integral part of its national planning processes. The government’s priority agenda from year 2018 to 2021 aligns with 13 of the 17 SDGs namely Goals, 1 to 4, 6 to 9, and 13 to 17. The High-Level Political Forum (HLPF) remains an important means which Tonga endorses, for the follow-up, monitoring, and accountability of commitment by member states through Voluntary National Reviews which are linked to the 2030 Agenda and the Addis Ababa Action Agenda. Tonga looks forward to presenting its first Voluntary National Report (VNR) report to the HLPF in 2019. The HLPF will also dedicate a day at its high-level ministerial segment to the mid-term review of the SAMOA Pathway in 2019. 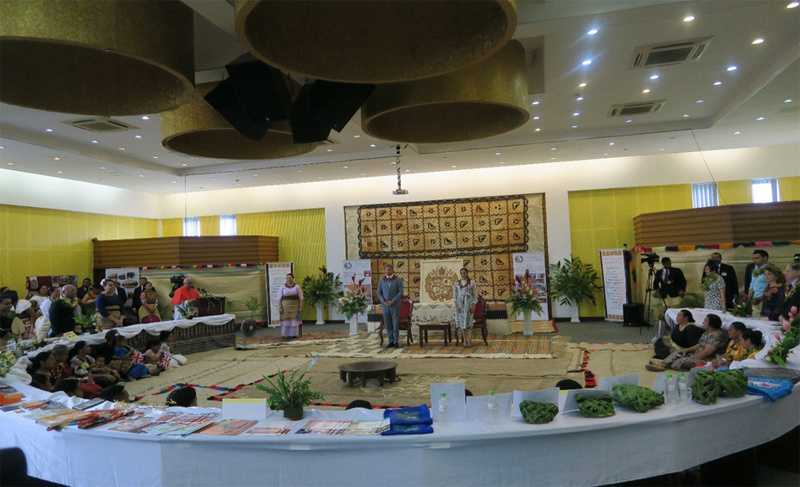 Tonga was pleased to host the Pacific regional preparatory meeting for the mid-term review of the SAMOA Pathway in June this year of which its outcome report forms the latest iteration of the Pacific’s sustainable development aspirations. Tonga looks forward to engaging with other SIDS and partners in Samoa at the end of next month to produce the final inter-regional report for the midterm review of the SAMOA Pathway for consideration at the HLPF next year. We recognize the important contribution of the United Nations Office of the High Representative for Least Developed Countries, Landlocked Developing countries, and Small Island Developing States, the United Nations Department for Economic and Social Affairs and the United Nations ESCAP Pacific office in this regard. Tonga welcomes the convening of the 3rd High-level Meeting on the Prevention and Control of Non-Communicable Diseases tomorrow. Combatting the threat NCDs presents to individuals, families and communities, has been recognized as being grossly underfunded given its magnitude. 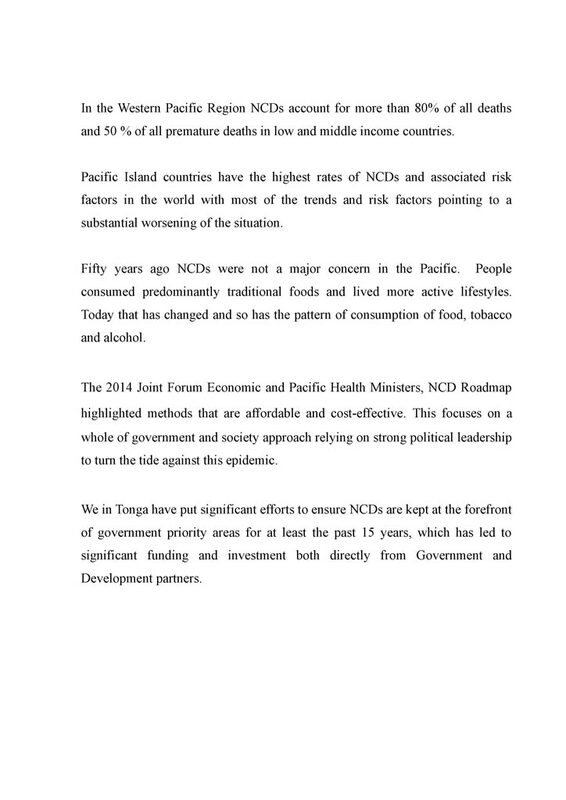 In Tonga, we are pleased to inform of commendable reductions in the prevalence of tobacco smoking and alcohol consumption. 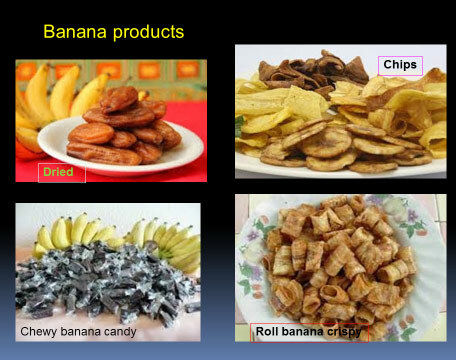 Tongan people are eating healthier food and involved more in physical activities. 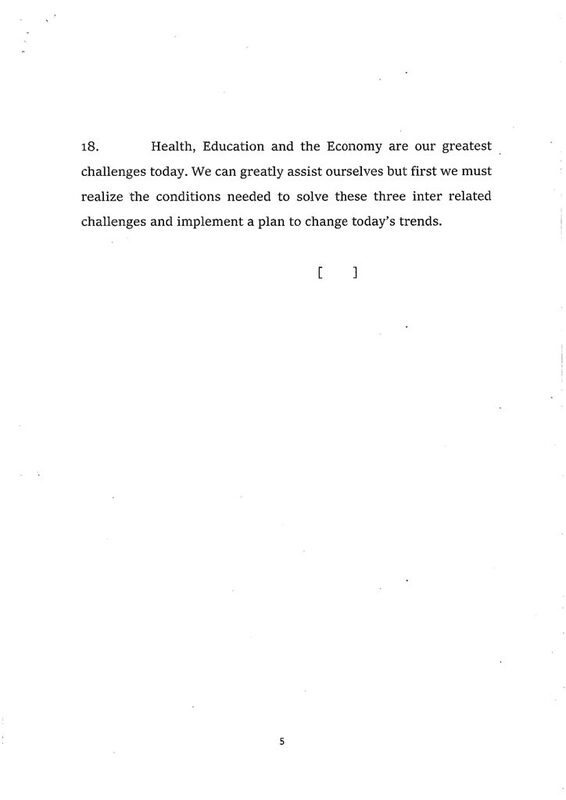 We are, however, not without challenges as evidenced, for example, in the rising obesity rates. The Tongan Government is addressing the issue by making unhealthy food choices more expensive and healthier food choices cheaper for the Tongan public. Climate Change continues to pose significant security threats to us as Island States. 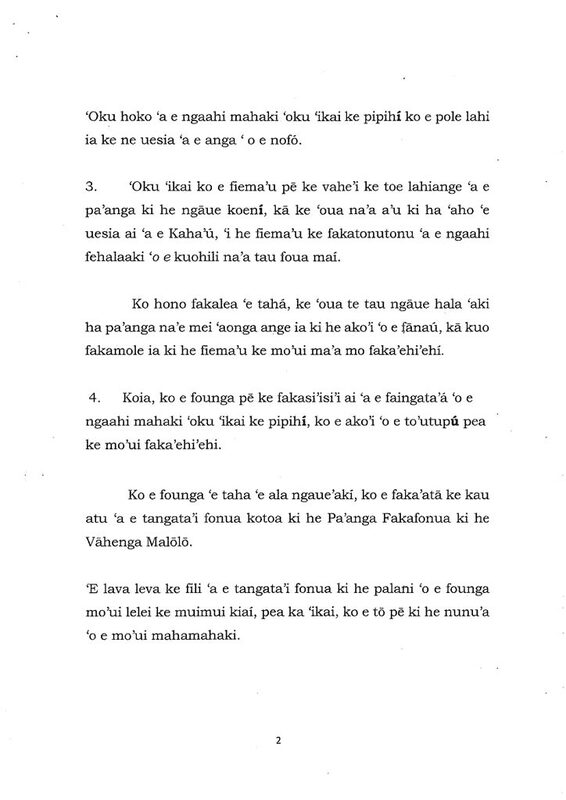 Pacific Leaders in Nauru earlier this month endorsed an expanded concept of security in their Communiqué and the Boe Declaration linking, inter alia, climate change and threats to international peace and security. 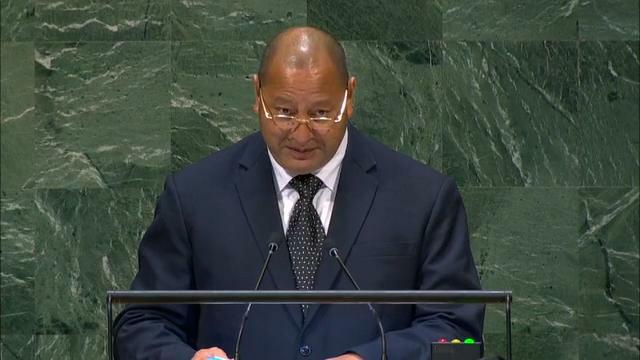 In this regard, Tonga welcomes the establishment of the Group of Friends on Climate and Security to further highlight the nexus between the threats of climate change with threats to international peace and security. We note with concern the devastating impacts of climate change on our marine environment. Baselines that determine our territorial boundaries, once established under the UN Convention of the Law of the Sea, should not be affected and should remain unchanged despite the effects of sea level rise. Our Sovereignty must not be compromised by climate change and we welcome the work of the International Law Commission on this critically important and timely issue for consideration of the Sixth Committee of the General Assembly. Tonga looks forward to taking our important work forward at the 24th Session of the UN Framework Convention on Climate Change, and strongly addressing the adverse impacts of climate change, and urgent need for innovation in adaptation for SIDS under the leadership of Poland in December. Tonga has engaged in this year’s first intergovernmental conference on the conservation and sustainable use of the biological diversity in the high seas and the seabed and we are hopeful that a gradual convergence of views will result in a zero draft of a legally binding instrument for consideration at the second and third meetings of the Inter-governmental Conference in March and August next year. Tonga has also continued its engagement at the International Seabed Authority ensuring the appropriate management of the resources of the Area. Tonga is grateful to the members of the Authority for its re-election this year to the Council and we look forward to working together in the development of the important draft Exploitation regulations. Tonga also looks forward to hosting the first Regional International Seabed Authority workshop in early 2019, to explore the benefits of seabed mining to the blue economy of Pacific Islands and to progressing the development of a regional treaty on deep sea mining. We would like to acknowledge Italy’s ongoing partnership with Tonga through the Joint Committee in strengthening Tonga’s capacity in the field of the environment and ocean. We also acknowledge the work of the Secretariat of the Pacific Community, the Commonwealth Secretariat, and the Pew Charitable Trust on the Regional Treaty. Tonga commissioned its first Independent Power Producer-owned Solar Farm last year and strongly believes that it can achieve its 50% by 2020 renewable energy target through more and stronger public-private partnership arrangements. Tonga wishes to acknowledge the partnership it has established with the Government of Austria, the United Nations Industrial Development Organization, and the Pacific Community, to establish the Pacific Centre for Renewable Energy and Energy Efficiency - a specialised regional entity to support private sector investments in renewable energy and energy efficiency in the Pacific Islands. We would also like to recognize and acknowledge the announcement made by the Government of Norway of its commitment to provide US Dollar 2 million in support of the important work of the Centre. Finally, sustainable development, whether it be, inter alia, through good health and well-being, climate action, life below water, or affordable and clean energy, can only be realized through international peace and security. We continue to look to the Security Council to protect the innocent from threats to international peace and security in whatever form, be they traditional threats such as armed conflict, or newer threats like climate change, to ensure no one is left behind. May Almighty God guide and bless you, and all the member states of the United Nations, their respective Governments, and our peoples. ‘Oku ou fakafeta’i ki he ‘Otua Mafimafi ko e tauhi hao mo malu ‘o tau toe a’usia ai ‘a e ‘aho ni, ki he Faka’ali’ali Ngoue ‘a e Vahe Fonua Vava’u. ‘Oku laumālie lelei pē ‘a e Kovana mo e Hou’eiki ‘o e Vahe Fonua ni pea pehē ki he Kau Minisitaa ‘o e Kapineti, Fakafofonga Fale Alea, Kau Taki Lotu kae’uma’a ‘a e kakai kotoa ‘oku tefua ‘i he Mala’e Nippon. ma’a mo faka’ofo’ofa ‘o Neiafu. Ko e ngāue pehē ni kuopau ke loto’aki ‘e he kakai pea ke kau kotoa mai ‘a e tukuikolo kae ‘asi hono makehe mo fakaholo mamata. 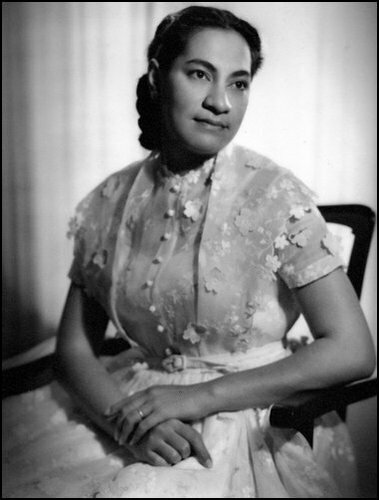 Ko e tokangaekina ‘o e hako tupu ‘o e Fonua ‘oku ‘ikai ko ha ngāue si’i, ke langa hake ‘enau mo’ui pea ke ‘aonga ho nau taleniti ki he famili mo e fonua. Ko e ako ‘oku ‘ikai ngata ia ha taimi ka ‘oku ne fakaava ha ngaahi matapa ki he mo’ui ke fakangata ‘a e masiva. ‘Oku ‘amanaki ke fakahoko ‘i he ta’u 2020 ha faka’ali’ali ngāue kehekehe ‘i he U.A.E pē ko e Fonua Fakatahataha ‘o e Hou’eiki ‘Alepea. ‘I he kuohili na’e fanga ki’i fonua iiki ‘e fitu ka kuo nau fakatahataha ke langa mo fefakatau’aki ‘o ngāue’aki ‘enau ma’u’anga ivi mei he Lolo ke nau tu’umālie ai pea mo ha toe ni’ihi kehe. Kuo tuku atu ‘enau fakaafe ki ha ngaahi fonua lahi ‘i Mamani ‘o kau ai ‘a Tonga ni. Ko e me’a mahu’inga ‘i he Faka’ali’ali pē Expo koeni, ko e koloa ‘oku tuku atu mei ho fonua mo e fakakaukau ‘oku ngāue’aki pea mo e maketi ‘e ala ma’u. Ko e koloa ‘e ala ma’u mei Tonga ni ko ha koloa iiki ka ko hono mahu’inga fakapa’anga ‘oku lahi, hangē ko e VANILA. ‘Oku fiema’u ia ‘i he fonua kotoa ‘i Mamani. Ko e IKA fo’ou mo mo’ui. Ko e MOKOHUNU ‘oku ‘ikai ko Siaina pē ‘oku ne fiema’u ka ‘oku toe ‘i ai mo e ngaahi fonua kehe. Ko e TOFE. Ko ia, tau kamata fakakaukau’i ha koloa ki he 2020 pea ke tau mateuteu he ko e palepale pē pavilion ‘a Tonga, ‘e lele ia ha ngaahi mahina nai ‘e fitu pē valu. Ko e kii ki he Faka’ali’ali ko e teuteu lelei mo e teuteu ke lahi. ‘Oku mahino ‘oku hokoatu ‘a e ngāue ‘a e Potungāue Toutai ki he fakalaka mo e fakatupu ‘o e ma’u’anga me’a tokoni mei ‘oseni, ‘i he toe lahiange ‘o e ngaahi ‘otu motu ‘oku nau kau ki he ngaahi ‘elia pule’i makehe ki he toutai, pea pehē ki he fakahoko ‘o e ngaahi fakatotolo ki he faama’i ‘o e limu mo e fokotu’u ‘o e ngaahi tauhele’anga ika. 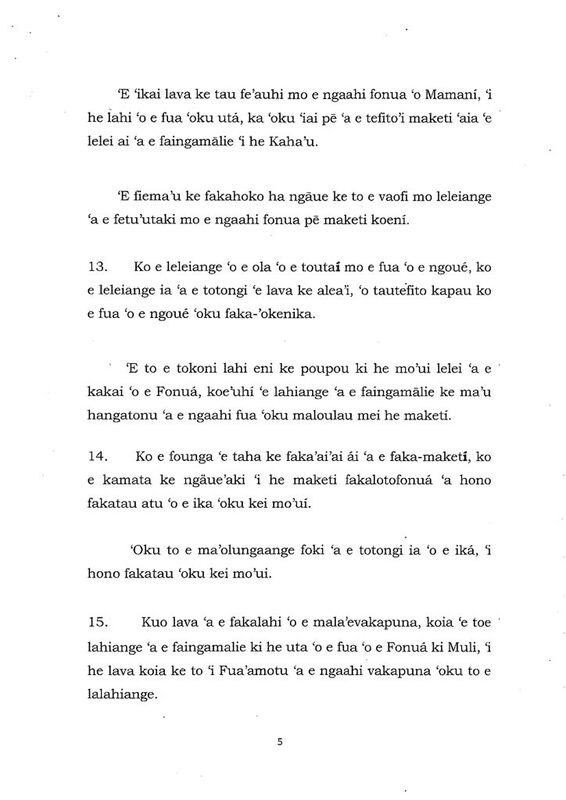 ‘Oku mahino foki ‘oku toe fakalaka ange hono faama’i ‘o e tofe, ‘i he funga ‘o e ngaahi tokoni mei Muli. Ko e ngāue eni na’a ‘iloa ai ‘a e Vahe Fonua ni, tukukehe ‘ene hoko ko e ma’u’anga pa’anga ma’ae ngaahi kautaha mo e famili. Ngāue ‘a e Kakai Fefine pea mo e Ngaahi Pisinisi ‘oku mou kau mai ki he Faka’ali’ali ‘o e ‘Aho ni. Pea pehē foki ki he kakai ‘oku nau fakatau ‘a e ngaahi koloa ‘o e ‘Aho. 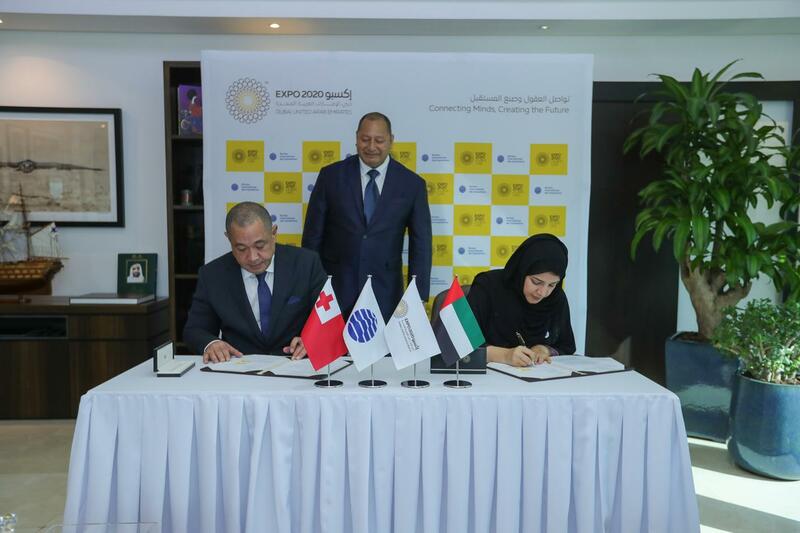 Talamonuu atu ki he Faka’ali’ali Ngoue ‘o e ta’u ni pea ‘oua na’a too ‘a Vava’u he Expo 2020. 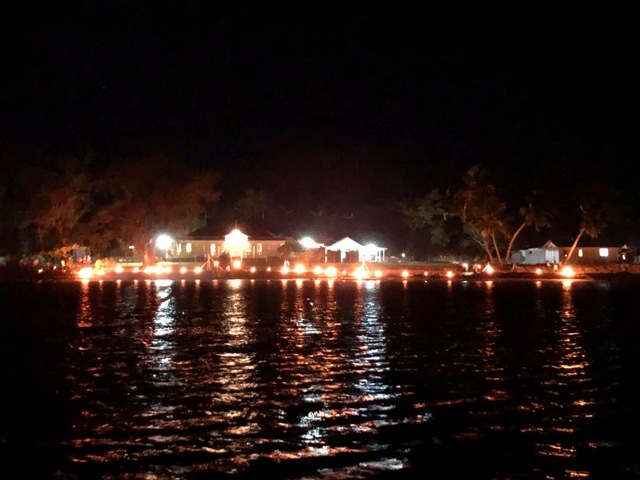 As part of their offerings for His Majesty King Tupou VI's birthday celebration, children of Ha'apai school performed Tutupakanava, a torchlight night watch ritual as part of their offerings for His Majesty King Tupou VI's birthday celebration. ‘Oku ou tuku ‘a e fakafeta’i ki he ‘Otua ko ‘etau a’usia ‘a e Konifelenisi hono Hivangofulu ma nima ‘i he Fale Lotu Fakamanatu ‘o Siaosi Tupou 1 ‘i Pangai, Haapai. Ko e me’angaue mahu’inga taha ke fakafepaki’aki ‘a e MASIVA ko e AKO. Kuo fokotu’u ‘e he Kolisi ko Tupou ha tu’unga fakaako faka-Mamani lahi ke ako’i ‘a e to’utupu ‘o e Fonua. Na’e hoko pē ia ‘i he ngaahi ta’u ‘e 150 kuohili, ka ‘oku to e fakafoki mai ‘i he ‘aho ni. 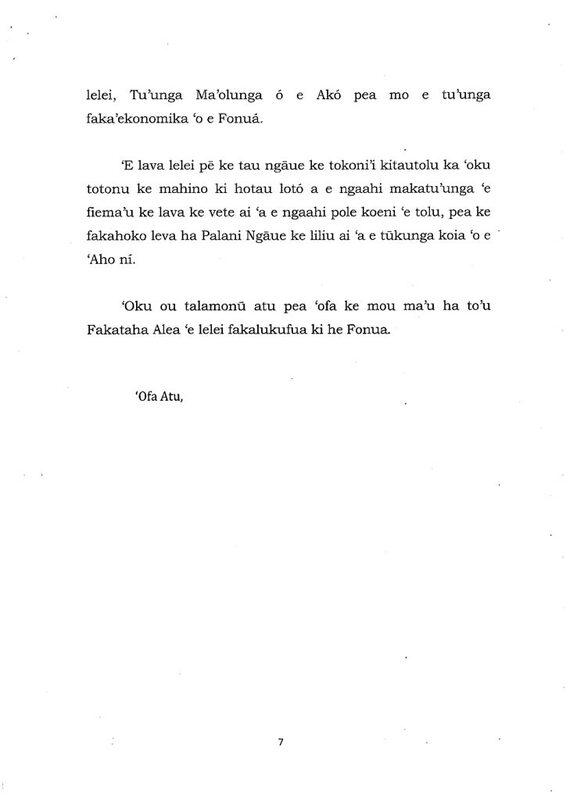 Na’e folofola ‘a ‘Ene ‘Afio Tupou V ‘o pehe, ‘e ‘omai ‘e he temokalati ha ngaahi pole ki he Siasi. Koia kuo ‘osi hoko eni ‘i he ngaahi fonua Temokalati ‘aia na’e langa hake ‘i he ngaahi tui faka-Kalisitiane, ‘o hangē ko ‘Amelika pea pehē ki ho tau kaunga’api ko Fisi mo Ha’amoa. Ko e pole lahi ko e mavahe ‘a e Ako mei he ‘Otua. Kapau ‘e loto ‘a e Siasi ke hoko atu ‘a e fakalakalaka ‘a e tu’unga ‘o e Ako fakamamani lahi ki he kotoa ‘o e ngaahi Ako ‘a e Siasi, ‘e lava pē ke fakahoko ia. Ka te tau fiema’u ha kau faiako ‘oku nau ma’u ‘a e tu’unga fakaako fakavaha’apule’anga. Na’a ‘oku lelei ke fakalotolahi’i ‘a hotau kāinga ‘i Muli ke nau tokoni mai ‘i ha faiako ha ta’u si’i pea tau toki fetongi kinautolu. Ko e faingata’a ‘o e Ako ‘e hangē pē ha pupuu nifo ha pepē fo’ou, kae ‘oua leva ke tau ma’u ‘i Tonga ni ha kau faiako ‘oku nau ma’u ‘a e tohi fakamo’oni ako fakavaha’apule’anga. Ka na’a ‘oku fiema’u ke to e liliu ‘e he Siasi ‘a e founga ‘oku fakalele ai ‘a e Ako ke lava ke fakafalala ki he Poate Ako ‘oku ne tokanga’i pē ‘ene ‘Api ako. ‘I he ngaahi fonua ‘e ni’ihi ko e Poate Ako ia ‘oku nau fili mo tokanga’i ‘a e ola lelei ‘o e ngāue ‘a e kau faiako ‘aia ‘e makatu’unga ai ha to e hiki hake ho nau vahengá. ‘I he founga ko eni ‘e lava ‘e he Siasi mo e matu’a tauhi fānau ke fakapapau’i ‘oku ma’u mai ‘a e kau faiako lelei taha ki he tu’unga fakamamani lahi pea mo tokanga’i foki mo e kau ako. ‘E lava ke ‘ataa pē ‘a e Potungāue Ako ‘a e Siasi mei he ngāue ki he ngaahi fakaikiiki, ka nau tokanga pē ki he kaveinga fakavaha’apule’anga ‘aia ‘oku ako’i pea tokanga’i foki ‘a e silapa ako ‘a e Siasi fakakātoa. ‘I he founga ko eni te tau lava ‘o liliu ‘etau founga Ako ke tautefito ki he kau ako ko e kaha’u ia ‘o e Siasi, ‘i hono fakapapau’i ‘oku fe’unga ‘a e founga ako fakakalisitiane pea ke fengaue’aki foki mo Tu’apule’anga. Ko e fehu’i leva he taimi ni pe ko e fe nai e taimi ke fakahoko ai ‘a e ngaahi liliu koeni. Ko e fokotu’u: ki he senituli ua ‘o e lotu ‘i Tonga. ‘Oku ou talamonuu atu ki he Konifelenisi mo Ha’apai mo e faka’amu ke tau ikuna ‘i he fakfepaki’i ‘o e masiva. 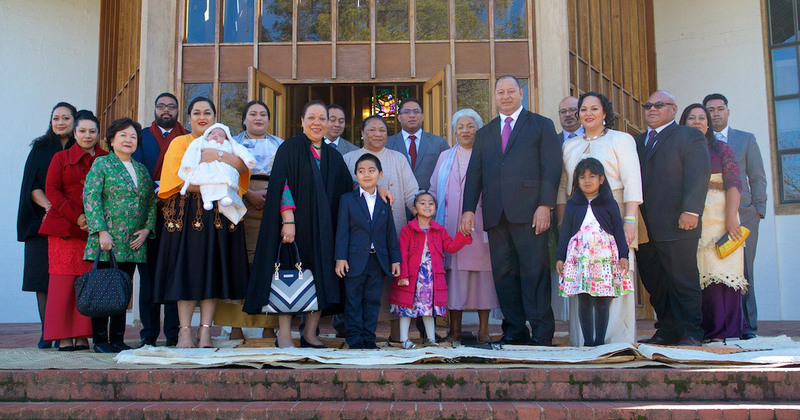 His Majesty King Tupou VI and HM Queen Nanasipauu paid a visit to Canberra, Australia to grace the Christening Ceremony for Her Royal Highness Princess Nanasipau’u Eliana, daughter of Their Royal Highnesses Crown Prince Tupouto’a ‘Ulukalala and Crown Princess Sinaitakala. The Christening Service took place on Sunday 10th June 2018 at the ANZAC Memorial Chapel of St Paul, Royal Military College Duntroon. The Officiating Minister was the Chaplain Maumau Monu (Lt Col). Also present at the Service were Their Royal Highnesses Princess Mele Siuilikutapu Kalaniuvalu Fotofili and Princess Sinaitakala Ofeina e he Langi Fakafanua; HSH Prince Tuipelehake, Lord Fakafanua Speaker of the Legislative Assembly, members and relatives of the Royal Family and friends including the colleagues of Crown Prince Tupoutoá Ulukalala from the Royal Military Staff College. The Christening Ceremony was followed by a Royal Luncheon at the Pialiggo Estate Glass House, Canberra. 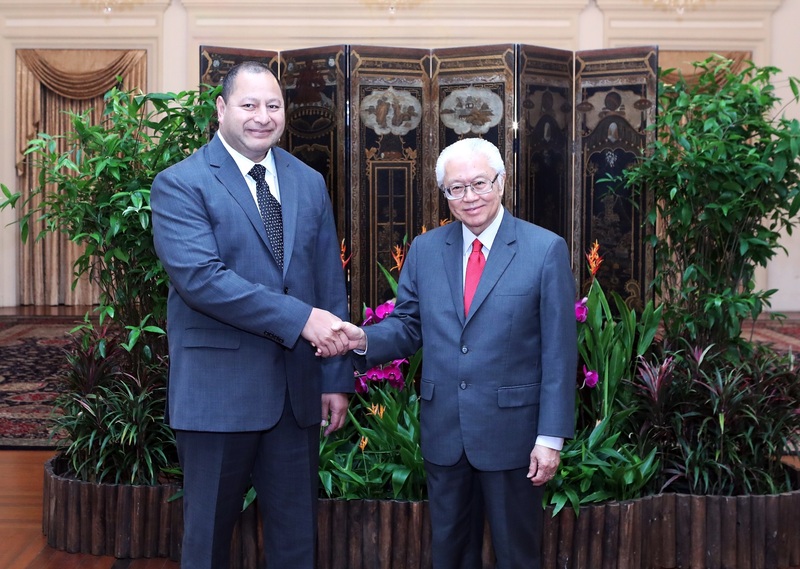 A recent visit by His Majesty’s Special Envoy to the United Arab Emirates whereby inter alia bilateral issues were discussed has seen the Government of the United Arab Emirates again support Tonga’s Energy Development. This follows on from the 512 KW Solar Station Grid Connected in Vava’u which was Commissioned by His Royal Highness the Crown Prince in 2013. The recent commitment of 7.8 million pa’anga (US$ 3.5 million) will support with co-ordination with the New Zealand Government to contribute to the Nuku'alofa Network Upgrade Project (NNUP) in Tonga. The project is aimed at not only improving the electricity network in Nuku'alofa, but also building resilience for the future. The Project also contributes to Nuku'alofa's support network following Cyclone Gita. The project will strengthen the existing network in 56 villages across five urban areas. The project will improve access, safety, and reliability through the modernisation of the electricity grid, reducing power outages and line losses, and improve the network resilience to severe weather events in the urban area - benefitting 8,470 households and businesses. This, the Nuku'alofa urban area, consumes 65 percent of Tonga's electricity. Following His Majesty’s concern about the destruction of cyclone Gita, this assistance will strengthen Tonga’s electricity network. 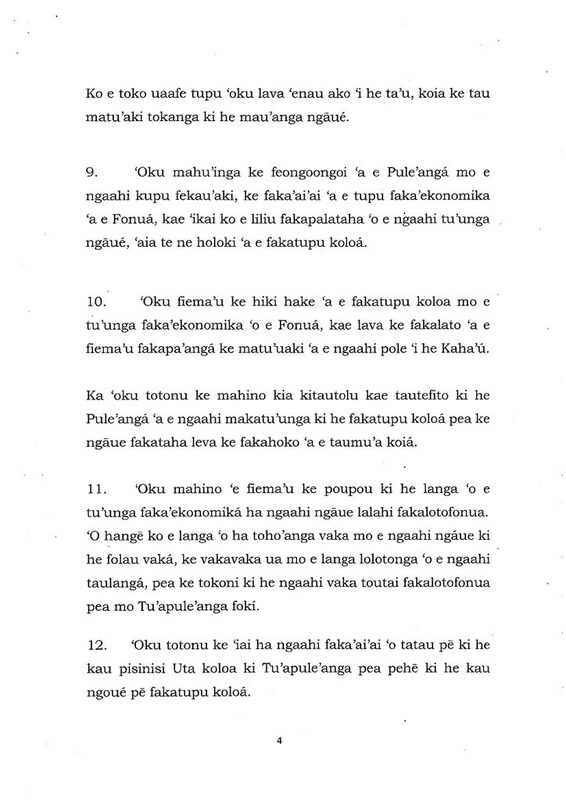 ‘Oku ou tuku ‘a e fakafeta’i ki he ‘Otua Mafimafi ‘i he ‘ene tataki pea tau tu’uta ki he ‘aho ni, ‘oku laumālie lelei ‘a e Sea pea pehē ki he Palemia mo Kapineti, Kau Fakafofonga ‘o e Hou’eiki Nopele mo e Kau Fakafofonga ‘o e Kakai. Kuo lava atu ‘a e ngaahi mahina ’i he hili ‘a e Afaa Talopiki ko Gita, mo e kei tokolahi pē ‘a e kakai ‘oku fiema’ú ‘a e tokoni. ‘Oku ou faka’amu ke to’oto’o ange ‘a e ngāue he ‘oku ha’u ‘a e fa’ahi ta’u mokomoko pea ‘oku uesia e kakai fakaenofo, fakaeloto mo faka’atamai foki. 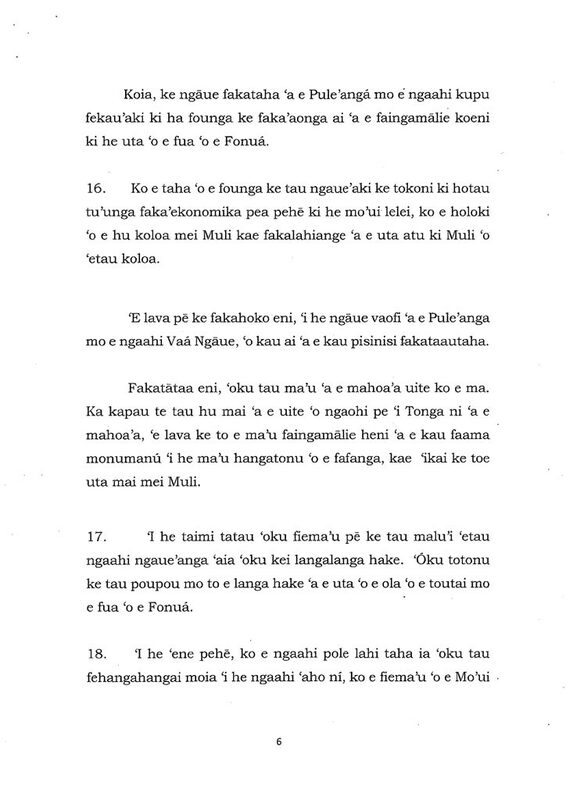 ‘Oku mahu’ínga ke ngāue ‘a e Fale Alea mo e Pule’angá, ‘o fakatatau ki he Lao. Koe’uhi kuo hā mai mei he ngaahi ta’u si’i kuohili, ‘i he tutu koia ‘o Nukualofa, ko e faka’auha ‘o e ngaahi pisinisi mo e mole ‘a e ngaahi mo’ui, ko e ola ia ‘o e maumau’i ‘o e Lao mo e nofo melinó. Ko ia, ko e fatongia ‘o kitautolu kotoa, ke malu’i hotau ‘Atakai, ‘o tatau pē ‘i he Fonuá pea ki ‘Oseni, koe’uhi ko e ngaahi to’utangata ‘i he Kaha’ú. Ka, ‘ikai ke fakapotopoto ‘etau ngāue’aki ‘a hotau ‘Atakai, pea ‘e ‘ikai ha fakatu’amēlie ma’a ‘etau fānau mo e kaha’u ‘o e Fonuá. Ko e tupu meia Gita, kuo hiki mai ai ‘a e Fale Alea ki he Senitaa Fakafonua koeni, ‘o hanga lelei atu pē ki he Potungāue Mo’ui mo e Falemahaki Vaiola pea ofi mai foki ‘a Falemasiva mo e Kolisi Tailulu. Ko e ongo kāveinga ‘oku na mamahi’i peau ‘omai he ta’u kotoa ki he Fale ni, ko e Mo’ui Lelei mo e Ako lelei ‘i he Fonua ni. ‘Oku taau foki ke fakataumu’a ke hiki hake ‘a e founga ki he tokanga’i ‘o e Mo’ui Lelei ki ha tu’unga ‘oku faka-Mamani Lahi ka ke tau kei lava pē ke fua. Ko e faingata’a lahi ‘oku tofanga ai ‘a e Fonua he ‘aho ni, ko e faito’o kona tapu. Ko e maumau ‘oku hoko ki he fānau, ngaahi famili mo e fonua ‘o e ‘aho ni mo e Kaha’u, ‘oku ‘ikai ala fakafuofua pē fakamahu’inga’i. Ka, ‘oku ‘i ai ‘a e ngaahi fonua ‘oku tautea ‘a e hia fekau’aki mo e faito’o kona tapu ‘o a’u ki he tautea mate. ‘Oku totonu ke tau fakapapau’i ‘oku ngāue ‘a e kau Taki mo e kau Fakafofonga ke fakatupu ha ngaahi ngāue ‘i Tonga ni ma’ae to’utupu, pea mo ha ngaahi faingamālie foki ‘i Tu’apule’anga. ‘Oku ‘uhinga eni ke a’usia ha ngaahi tu’unga fakaako fakavaha’a-Pule’anga ‘i Tonga ni, ke fe’ungamālie mo e ngaahi tu’unga fakaako ma’olunga ange ‘í he ngaahi ‘api ako ‘i Tu’apule’anga, ‘oku ‘ikai ke lava a’usia ‘i Tonga ni. Koe’uhi, ke lava ke tau fakahu atu ki he ngaahi ‘Univesiti ‘a e fānau ako te nau ako pea nofo ‘i Tonga ni ke langa hake hotau Fonua. ‘Oku hā mai mei he ngaahi ta’u si’i kuohili, ‘oku hangē ‘oku fakataimi nounou pē ‘a e ngaahi taumu’a ngāue, lolotonga ko ia ‘oku totonu ke ‘i ai ‘a e Palani loloaange ki he Kaha’u, koe’uhi ko ‘etau visone ma’ae Fonua ‘oku totonu ke taimi loloa ia ‘o laui ta’u kae ‘ikai ke fakangatangata pē, ‘o fakatatau ki he ngaahi ta’u ngāué. ‘E matu’aki tokoni heni ka tu’unga tatau ‘a e Taki, ko e Palani mo e Visone. 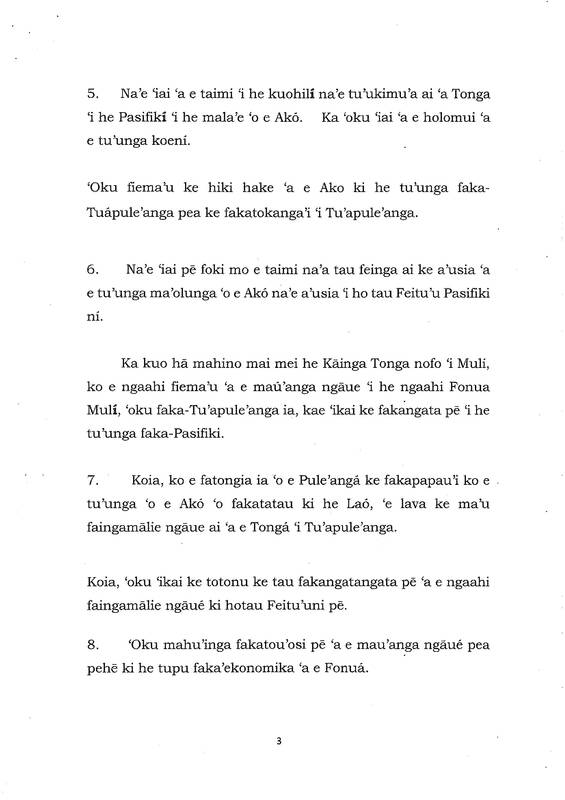 ‘Oku fakatokanga’i ‘a e ‘ofa mo e feilaulau ‘a e kāinga Tonga mei he ngaahi Fonua Muli, ko e tokoni ki he ngāue langalanga hake ‘oku lolotonga fakahoko ‘í he Fonua. ‘Oku ‘iai á e fakamālō ki he Ngaahi Pule’anga Muli pea mo e ngaahi Kautaha fakavaha’a-Puleanga mo fakataautaha ‘oku nau fakahoko mai ‘a e ngaahi tokoni ki he langa fakalakalaka ‘o e Fonua. Fakatauange ke mou ma’u ha Fakataha Alea ‘e lelei fakalukufua ki he kakai mo e Fonua pea langilangi’ia ai hotau ‘Otua. His Majesty King Tupou VI bestowed honours of the Royal Military Order of Saint George to members of His Majesty’s Armed Forces and the Tongan Police Force, at a private investiture ceremony held at the Royal Palace on Friday the 4th of May, 2018. The investiture ceremony marked the birthday of King George Tupou V who founded The Order of Saint George in 2009 to recognise distinguished and meritorious service by members of the uniformed services. This year’s recipients have embraced their responsibilities, achieved excellence through unresented training, extraordinary dedication, selfless devotion and have upheld their duty of honour. In attendance at the ceremony was Brigadier Lord Fielakepa, Officers from both HMAF and the Tongan Police Force and family members of the recipients. An MOU exempting entry Visa requirements between the United Arab Emirates and the Kingdom of Tonga was signed on the 23rd of April. The MOU will permit Tongan diplomatic and Official passport holders to be exempt from visa requirements. It will also be extended to include Ordinary passport holders to allow Tongan nationals to visit the United Arab Emirates for up to 60 days without a visa. The value of imports into the UAE on an annual basis is in excess of TOP 250 billion. Daily flights operate direct from Auckland to Dubai, on the worlds largest commercial airliner (A380) thus enhancing the business opportunities for high yield exports from Tonga (fisheries, agriculture and in the near future labour force) and opens new trade doors for our Kingdom. 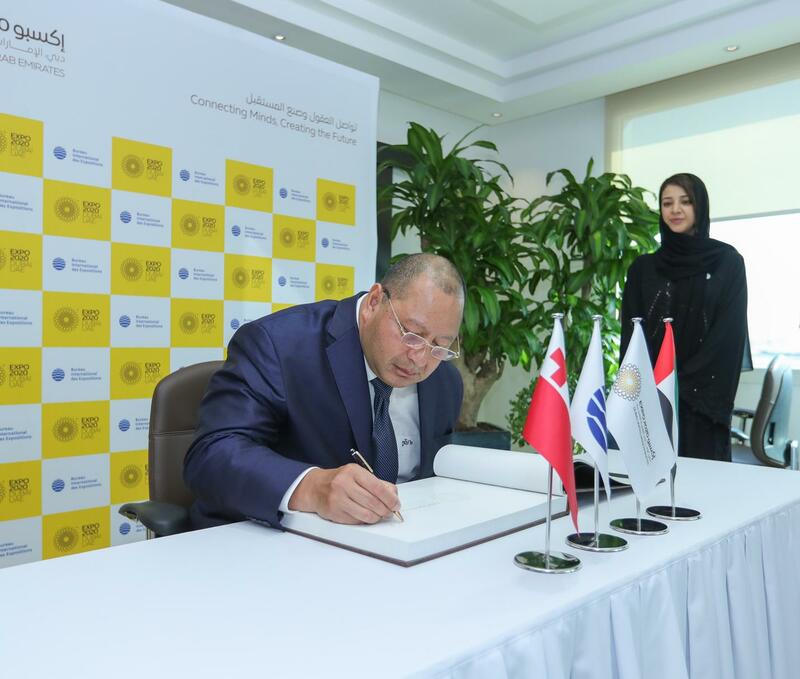 All of the major European universities and United States of America now have satellite campuses in the UAE and this allows the opportunity for Tongans to access short term study in the UAE. New Zealand , Fiji, and other pacific island countries have recently signed a similar MOU because they too appreciate the opportunities available to them for trade and investment with the UAE. With a number of Tongan Nationals currently working already in the UAE this MOU will facilitate easier access for friends and family to visit without the previous restrictive visa requirements. His Majesty’s special envoy to the UAE, ‘Akau’ola, after signing the agreement on behalf of His Majesty, said "when you consider how Dubai and Abu Dhabi are two of the safest , friendliest most developed cities in the world the visa free MOU for the people of Tonga is a testament to the high level of respect the UAE places in His Majesty and the people of Tonga". 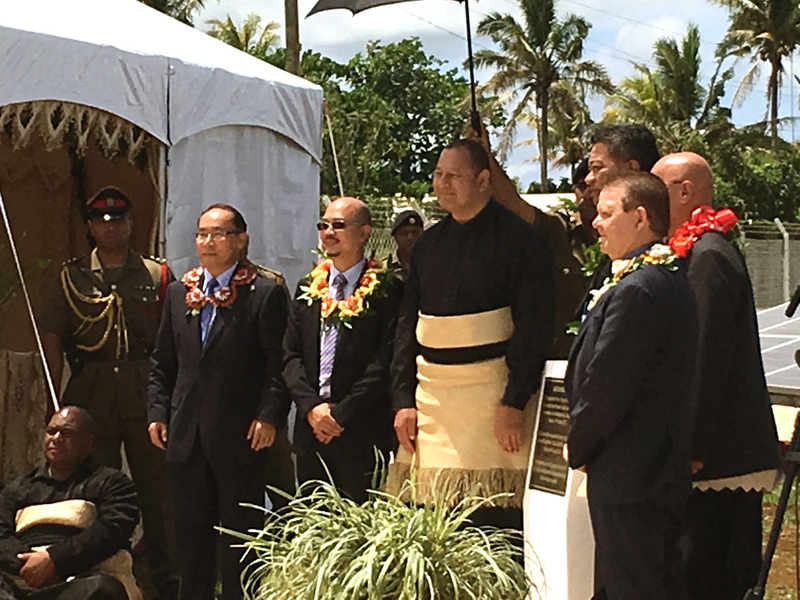 Accompanied by HMQ Nanasipau'u, HM King Tupou VI officiated the commissioning of the Matatoa Solar farm on October 17. 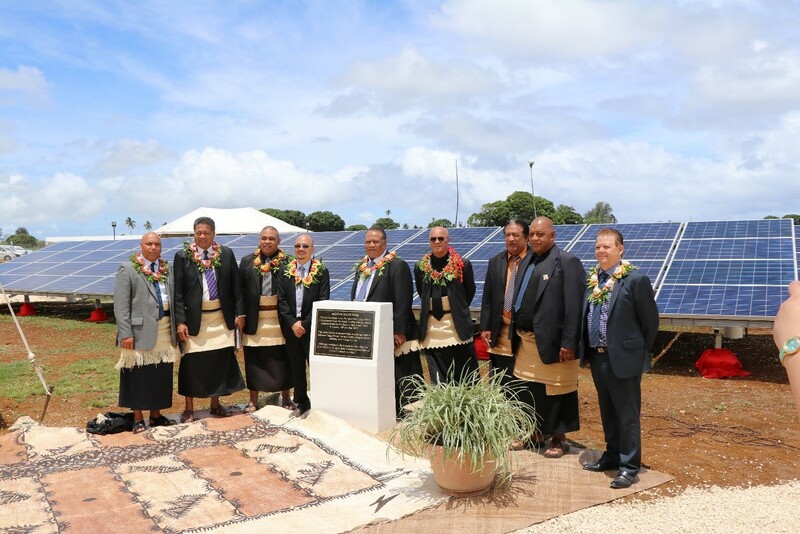 The 2-megawatt solar facility in Tofoa aims to join the global effort of renewable energy generation and reduce electricity tariff significantly. The largest solar farm installed in the kingdom consists of 7440 solar panels and covers 6.3 acres. 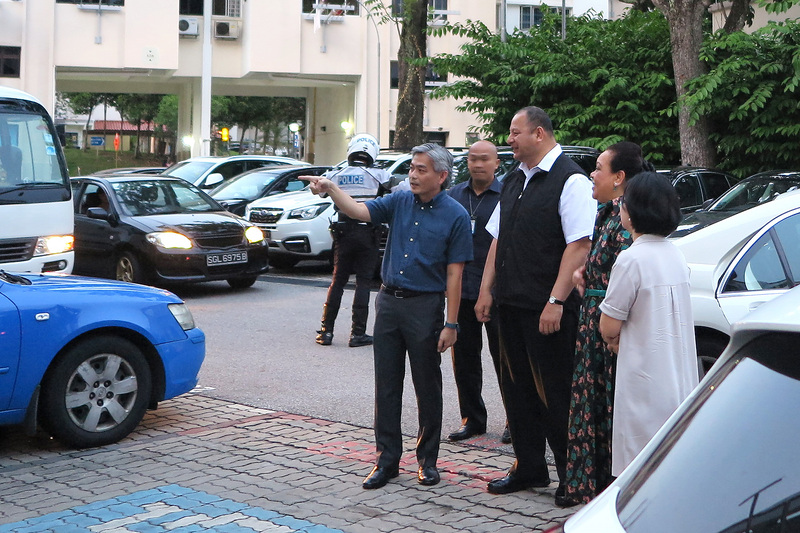 It is expected to generate over 2,828,84 kWh of electricity over the first year of operation which is an equivalent of 680, 000 litres of diesel which could be saved in its first year of operation. "The solar plant alone is expected to add another 5% towards the nation’s renewable energy target", stated by the Minister for Public Enterprises and MEIDECC, Hon. Poasi Tei. I congratulate you on the assumption of your presidency of the 72nd Session of the United Nations General Assembly and I assure you that the Tonga delegation will fully support your able leadership in revitalizing and enhancing the crucial role of this august Organization. I express gratitude to your predecessor, His Excellency Mr. Peter Thomson, a distinguished son of the Pacific Islands Region, with progressing the implementation of the 2030 Development Agenda and successfully convening the inaugural Ocean Conference this year. I also commend His Excellency Mr. António Guterres the United Nations Secretary-General, for the sterling stewardship since the beginning of his first year at the helm. 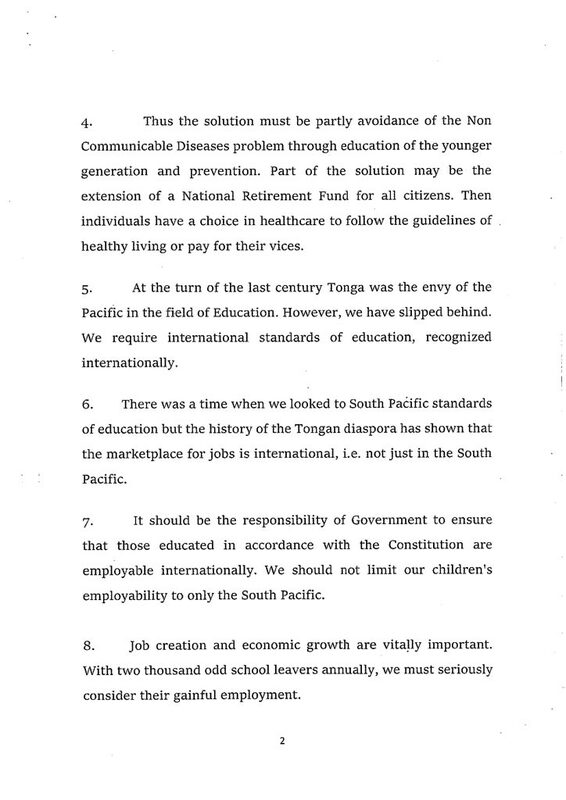 The Tonga delegation will fully support your important reform work. We send our message of solidarity and sympathy to the people of Mexico, their families and friends affected by the devastating earthquake and; to the millions of people in the Caribbean and all those affected in recent weeks by the utter ravages of successive hurricanes. My delegation and I welcome your timely and relevant theme: "Focusing on people: striving for peace and a decent life for all on a sustainable planet.” It essentially emphasizes the peaceful wellbeing of all people and the conservation and sustainable use of our global resources for present and future generations. Implementation is therefore crucial through sincere partnerships to collectively achieve the targets, goals and objectives stipulated under international law and internationally agreed outcomes. In contributing towards the implementation of the 2030 Agenda for Sustainable Development, including the international agreed blueprint for the sustainable development of small island developing States (SIDS), the SAMOA Pathway, Tonga has established a National Monitoring Mechanism. In this regard, we wish to acknowledge the support of the United Nations Development Programme (UNDP). The United Nations Development Assistance Framework (UNDAF) 2013-2017 will conclude at the end of this year. Subsequently, the 5-year programme cycle entitled United Nations Pacific Strategy (UNPS) 2018-2022 for 14 Pacific Island Countries, which was signed in August 2017 at the UNDP Pacific Office, will commence. 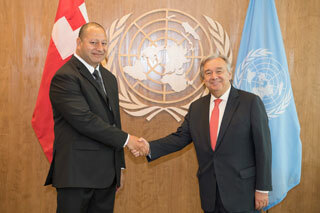 The close partnership between the Government of Tonga and the United Nations System to effectively implement the integrated Tonga Strategic Development Framework and the Agenda 2030 is reinforced through the coordination of UNPS 2018-2022 by the United Nations Joint Presence Office Delivering as One, which is led by the UNDP in Tonga. It is strategically positioned to provide technical advice to the Government, NGOs, Civil Society, and the Private Sector. We also note the new senior management appointments by the UN Secretary-General. We welcome the appointment of the first woman from Tonga and the Pacific Islands Region to shepherd the important advocacy and facilitation work in the years ahead of the Office for the Least Developed Countries, Landlocked Developing Countries and Small Island Developing States. We fully support the goal of gender parity, including at all levels in the United Nations Organization. The 2017 High Level Political Forum (HLPF) enabled the review of 7 Sustainable Development Goals (SDGs) in particular: Goals 3, on Good health and well-being; 5, on Gender equality and the empowerment of women and girls; and 14, on the Ocean and its resources. We commend the President of the Economic and Social Council for his initiative to devote adequate time to underscore and examine the complex sustainability challenges facing SIDS, as a Special Case, and thereby enhance efforts to implement the commitments called for in the SAMOA Pathway. The High Level Political Forum remains an important means for the follow-up, monitoring, and accountability of commitments to SIDS, which are essentially linked to the 2030 Agenda and the Addis Ababa Action Agenda. We fully support Fiji’s Presidency of the 23rd Conference of Parties to the United Nations Framework Convention on Climate Change this year, to strongly address the adverse impacts of Climate Change and urgent need for innovation in Adaptation for SIDS. We note the role of the International Monetary Fund, the World Bank, and the Asia Development Bank in availing disaster finance and respective financial tools to all SIDS. While acknowledging their work on expanding the definition of "fragility”, we urge further refinement of operational financing decisions to include the drivers of vulnerability experienced in the Pacific Islands region, particularly natural disasters and adverse economic shocks. We reiterate our call for the appointment of a Special Representative on Climate and Security to ensure that the UN System has the appropriate tools to respond effectively and efficiently to Climate Change as an existential threat and a mounting security challenge for SIDS and the entire international community. Enhanced accessibility to modern and clean sustainable energy services, energy efficiency, and the use of economically viable and environmentally sound technology and research, play a critical role in our sustainable development. Mitigation efforts are also essential to overcome the challenges of excess dependence on imported fossil fuels. To further strengthen international and regional cooperation, the Pacific Centre for Renewable Energy and Energy Efficiency (PCREEE) was established in Tonga in April of this year. The Centre provides valuable support to Pacific Island countries and territories towards progressing their respective priorities and commitments for achieving sustainable energy and contributing to SDGs 7, 9 and 13. It is a partnership between the Pacific Community, the Government of Austria, the United Nations Industrial Development Organization, and SIDS-DOCK, amongst others. The General Assembly acknowledged the PCREEE upon adoption of the biennial resolution entitled: 'Cooperation between the United Nations and the Pacific Islands Forum' in July this year. However, we have, and continue to, experience the negative impacts of ocean degradation to our livelihoods and culture due to the anthropogenic activities and inter-related devastating effects of climate change. We already actively contribute to the implementation of SDG 14 and look forward to a strong collaboration with all interested parties. We hosted this year an international whaling meeting. 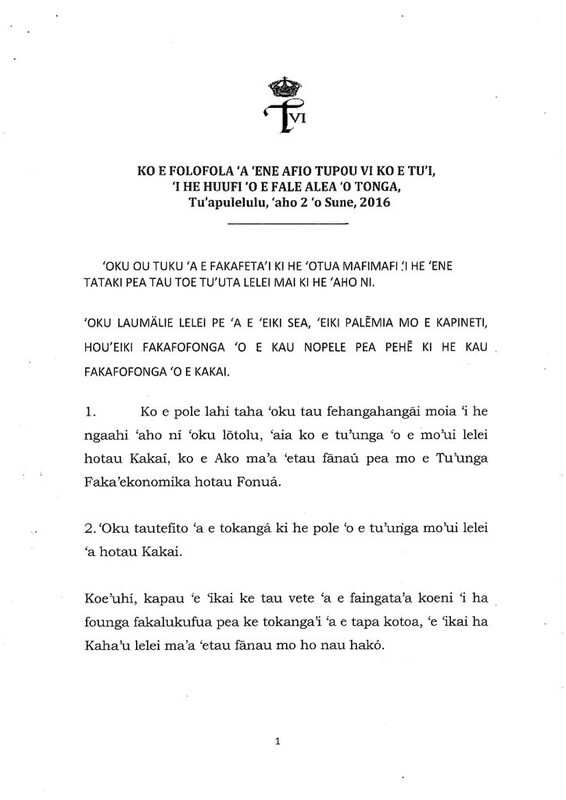 The farsighted 1978 Royal Decree by His Majesty the Late King Tupou IV already banned whaling in Tongan waters. This farsighted decree was issued four years before the international ban on whale hunting came into effect. This was re-affirmed during the April 2017 International Conference on Whales in a Changing Ocean we were honored to host. We may be a Small Island State but all SIDS are large Ocean States. To us and our people, successful implementation of Sustainable Development Goal 14 is critical for the pathway towards sustainable development and its inter-connection with achieving other goals such as those related to food security, water and sanitation, health, economic growth, and sustainable production and consumption. Strong political will for a whole-of-government approach, towards mainstreaming ocean-related actions from international, regional, and national development plans and strategies, will ensure the inclusive participation and efforts of all stakeholders including local communities and the private sector. 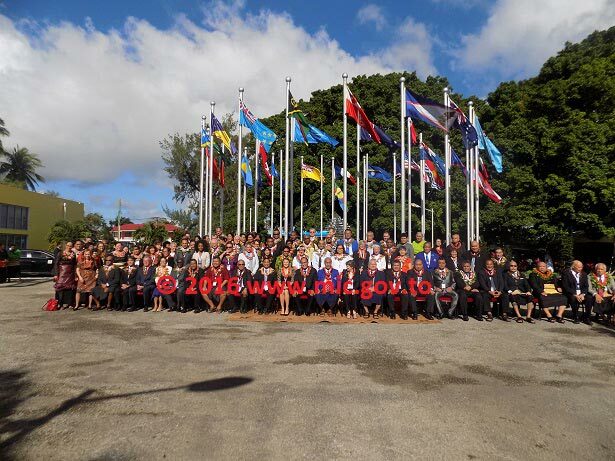 Tonga joined the international community in endorsing the "Call for Action” outcome document of the Ocean Conference in June that contains almost 1400 voluntary commitments by stakeholders including 8 from Tonga. 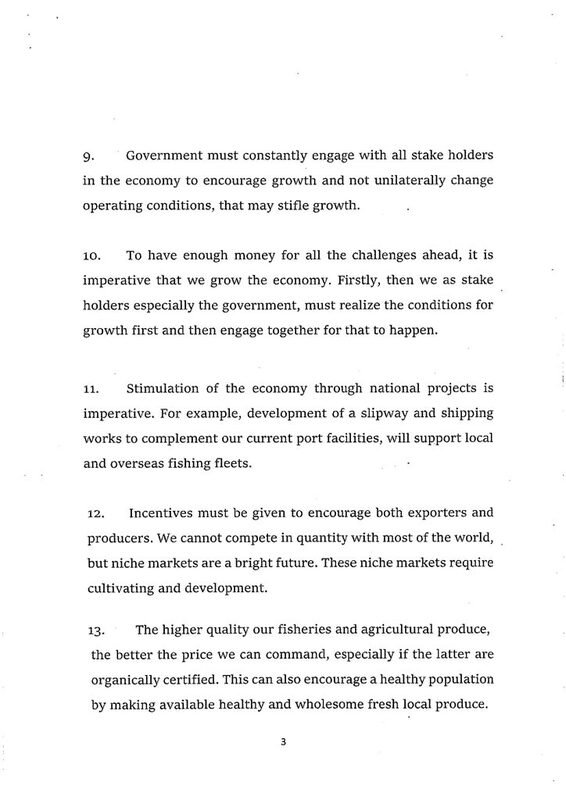 It is a basis for the development of a blue economy or a Blue Charter as proposed by the Commonwealth Secretariat. There is urgency to develop practical guidelines and toolkits to assist States in delivering on all targets under Goal 14 in an integrated manner. We acknowledge the completion of the work of the preparatory committee on the development of a legally binding instrument under the UNCLOS for the conservation and sustainable use of the biological diversity in areas beyond national jurisdiction. Tonga maintains its support for the early commencement of an intergovernmental conference to initiate negotiations on a substantive text. We embrace the ongoing work of the International Seabed Authority in its administration and management of resources in the ‘Area’ in accordance with the ‘Common Heritage of Mankind’. Tonga congratulates the Secretary-General of the Authority in his first year in office, as he works with member states to develop the important exploitation regulations which must strike the appropriate balance between the conservation of the natural environment in which mineral resources exist, and its sustainable use. Consultations must be transparent and inclusive to ensure this balance is achieved. Tonga continues its engagement as a member state of the Authority and is seeking re-election to the Council at the 24th Session of the Authority in 2018. A Tongan national with other members of the Legal and Technical Commission, provide expert views to facilitate the work of the Commission in developing the important financial mechanism to ensure fair and equitable distribution of returns from seabed mining. Tonga reiterates the call made under the SAMOA Pathway for genuine and durable partnerships to ensure no one is left behind. A very credible partnership mechanism between the 12 Pacific SIDS and Italy, Austria, Luxembourg, and Spain is exemplified through the Joint Committee. It has been ably co-chaired by Italy and the Chair of the Pacific SIDS throughout each year since 2006. Tonga has thus benefitted through projects related to renewable energy, water, capacity-strengthening of young Government officials and more recently, marine protected areas. We welcome the establishment of the India-United Nations Development Fund through the UN Office for South-South Cooperation, which launched a project implemented by the UNDP for the establishment of early warning systems in Tonga and other Pacific Island Countries. The system relies on the timely provision of disaster risk information, guidance on how to act upon warnings, and ensuring a constant state of preparedness. Sustainable development is possible where there is peace and security and sustainable development is key to peace and security. Finally, we urge all Leaders to focus and reflect on how best their power and legitimacy will benefit their own people and the entire world. We appeal for a speedy resolution to the current tensions in the Korean Peninsula that is affecting Global Peace and Security. I congratulate the UN Secretary-General for the recent establishment of the High Level Advisory Board on Mediation to advise him on specific initiatives and related efforts around the world. May the Almighty God guide and bless you and all the member-states of the United Nations and their respective Government and people. The Sustainable Economy Philosophy (SEP) is a tool for strengthening the economic foundation at the family level, then community level and finaly at the national level. 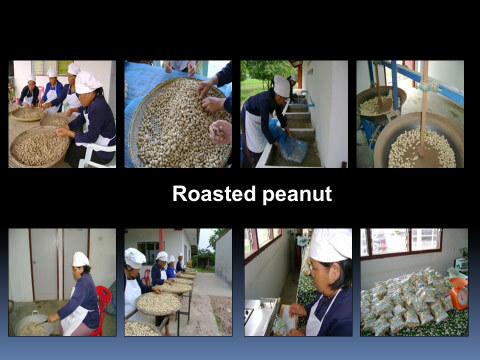 SEP promotes meeting subsistence needs of the household as the primary concern and then bringing surplus to the market. In line with the SEP project work plan the emphasis of this study visit was on agricutural produce processing facilities applicable to Tonga. 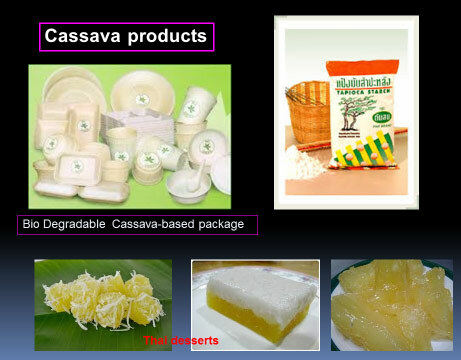 The team toured two large facilities, one processing sugar cane for sugar with its bi–product ethanol in Supanburi Province, a second one in Lopburi Province for cassava ethanol with its bi-product starch. 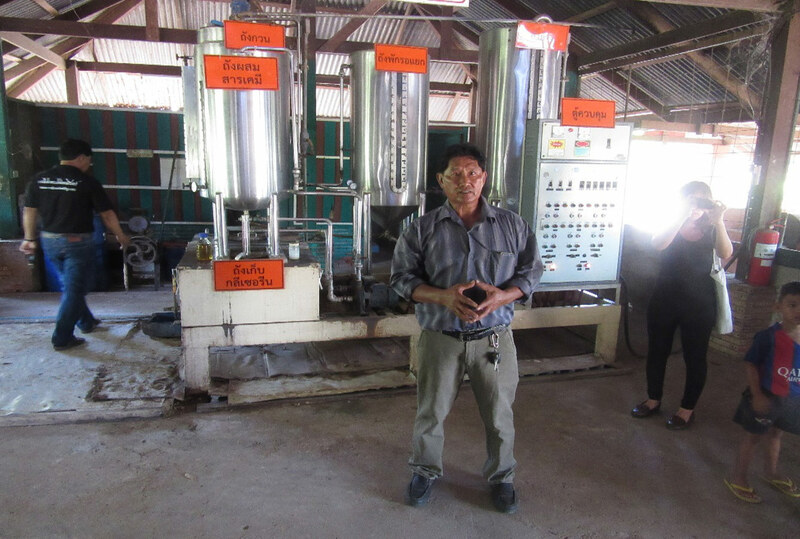 These facilities concentrate on large scale production however, the concept can be replicated in Tonga on a smaller scale. The empahsize of the visit was on small scale facilities and village orientated projects that can be easily replicated and tailored to suit the Tongan environment. The following highlights the team’s visit to particular projects that relate to Tonga’s circumstances. 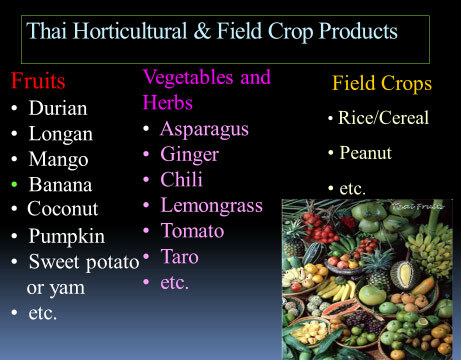 Agricultural, horticultural and field crop products grown in Thailand are similar in nature to Tonga. 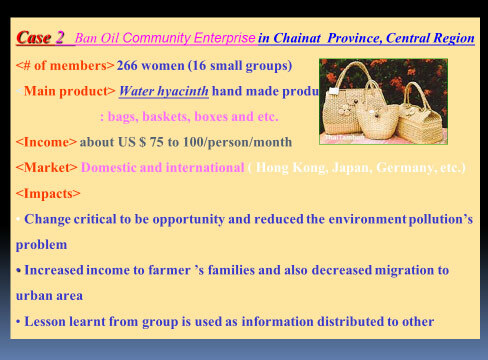 The processing method in Thailand is simple and easy for adaptation by the farmers and village communities. It maximizes the use of tradional methods. 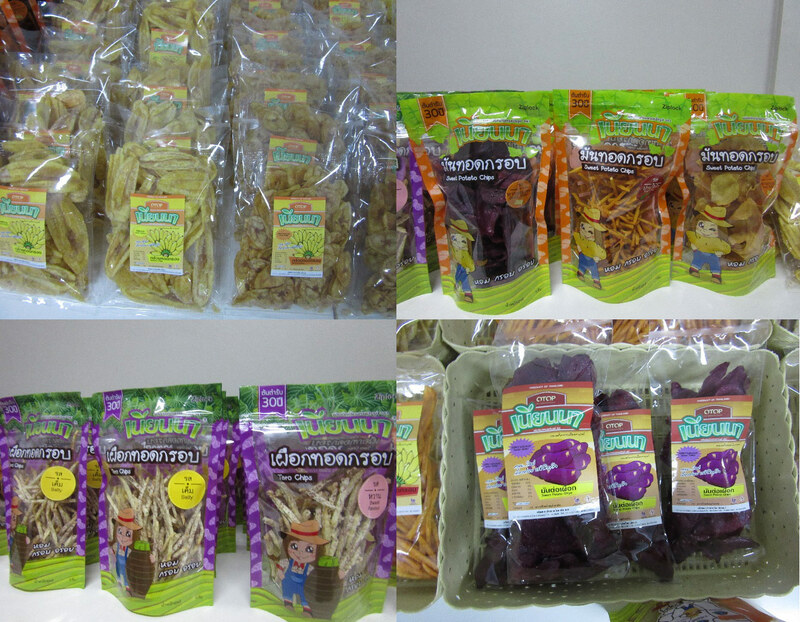 Thai village processing facility in Prachuap Kiri Khan Province for the domestic market, their main produces are similar to those in Tonga which are sold in an unprocessed state. 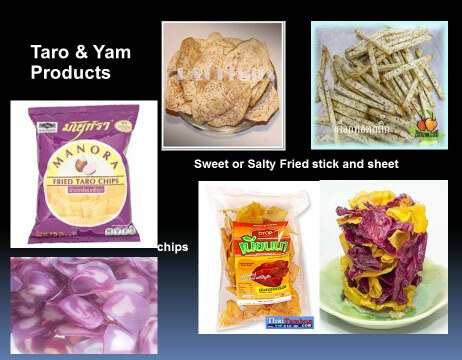 The Thai concept produces value- added products through simple preservation methods and packaging that facilitates higher market prices and promotes export. 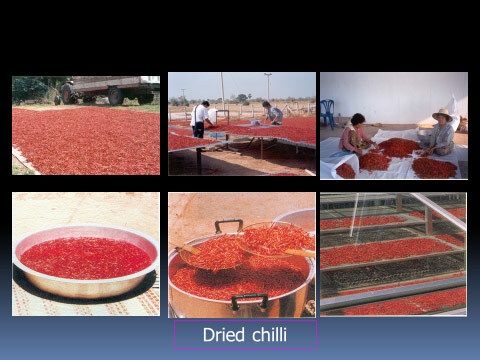 This one village project processes chilli, peanuts, taro,yam, cassava and livestock products. The produce are grown by the men of the village while women operate the processing facility producing the end product for for the market. 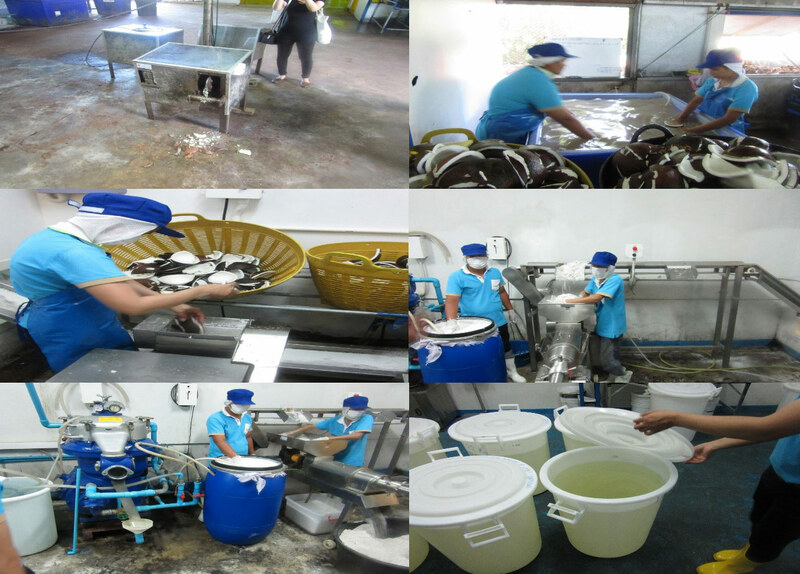 The Siamplus Coconut Oil Company in Prachuap Kiri Khan Province, a small scale facility that has 15 employees and produces 2 tons of virgin coconut oil from 20,000 coconuts a week using a centrifuge process. 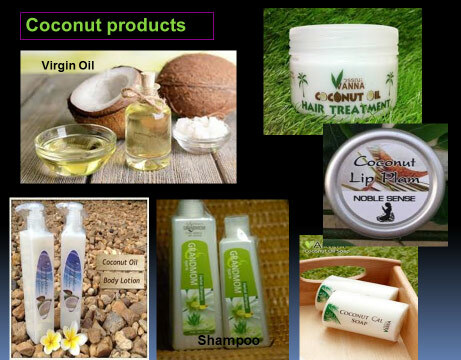 This process allows the company to process and market raw virgin coconut oil to other facilities that refine or process it further. 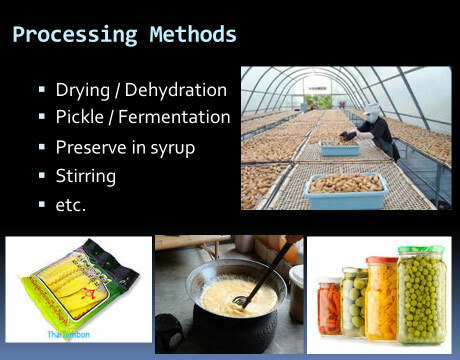 Two successful case projects of small scale processing operations. The product pictured above are from water hyacinth that is a free-floating perennial aquatic plant native to tropical and sub-tropical conditions and can be found in the fresh water lakes of Tofua and Niuafo’ou. SEP promotes the best available methods by leveraging local expeirence and knowledge. 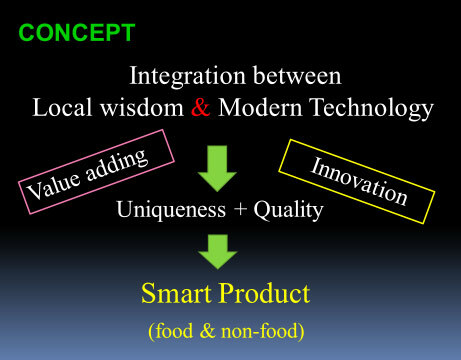 The result is a smart product that sucessfully promotes import subsitution. The concept is supported by Government Regulation and Product Quality Certification ensuring qualification for the domestic economy. This certification process allows for consumption by the large and valuable tourism market in Thailand. 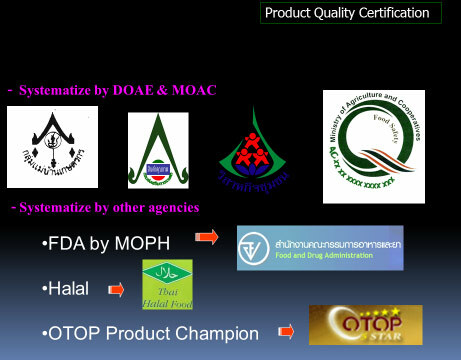 OTOP stands for ‘One Tambon (meaning sub-district) One Product’. 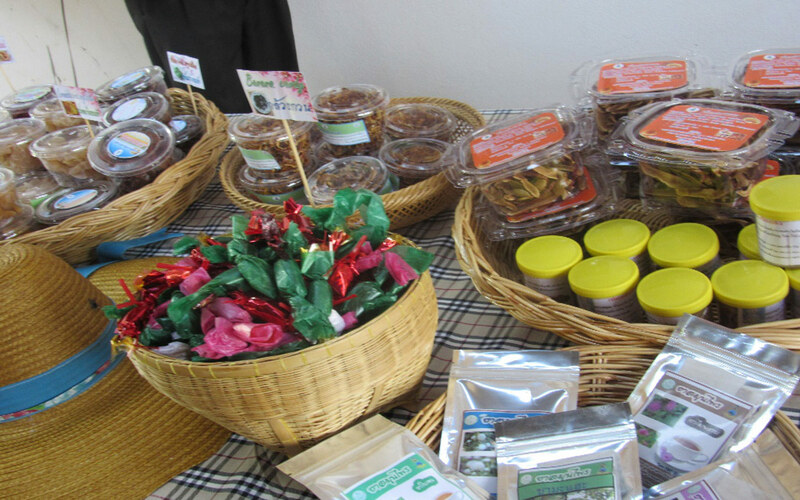 It is a local entrepreneurship stimulus program which supports unique, locally made and marketed products of each Thai tambon all over Thailand. 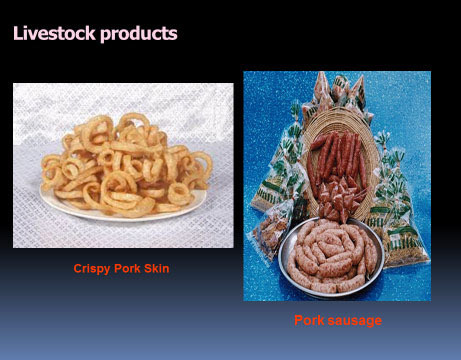 It selects one superior product from each tambon to receive formal branding as a showcased OTOP product and provides a domestic and international stage for the promotion of these products. Some of the many OTOP products include handicrafts, cotton and silk garments, pottery, fashion accessories, household items and foods. Below, the team visited a successful OTOP family operated facility in Kanchanaburi Province that produce and process root crops similar to those grown in Tonga. 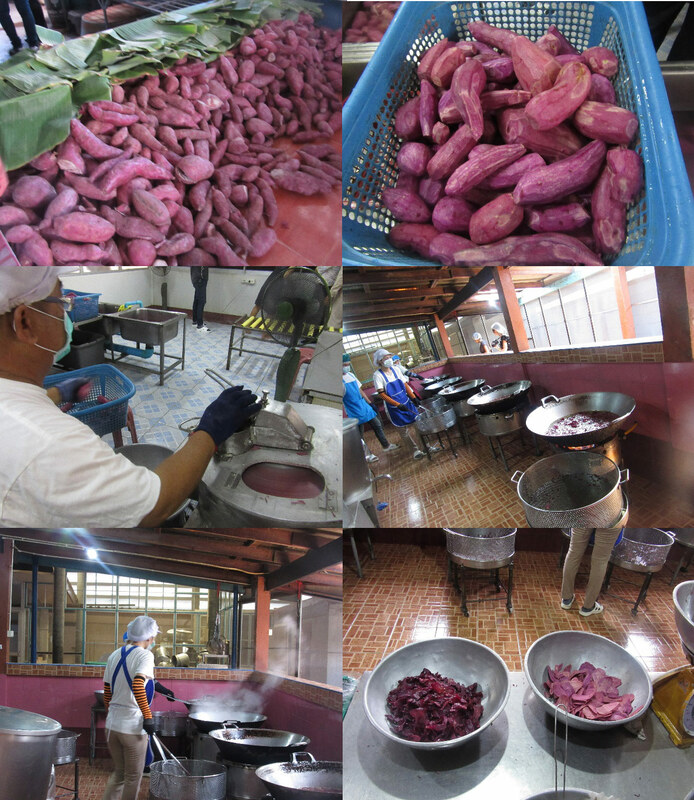 During the team visit, sweet potatoes or in Tongan, kumala were being processed. The team visited one OTOP village in Khanchanaburi that processed bio-ethanol fuel from waste cooking oil collected weekly from house hold kitchens and restaurants within the area. In the picture below the supervisor explains how their bio–ethanol plant works providing fuel for their agricultural machinery. The SEP Philosophy was introduced to our Kingdom through the vision and foresight of King Tupou VI. 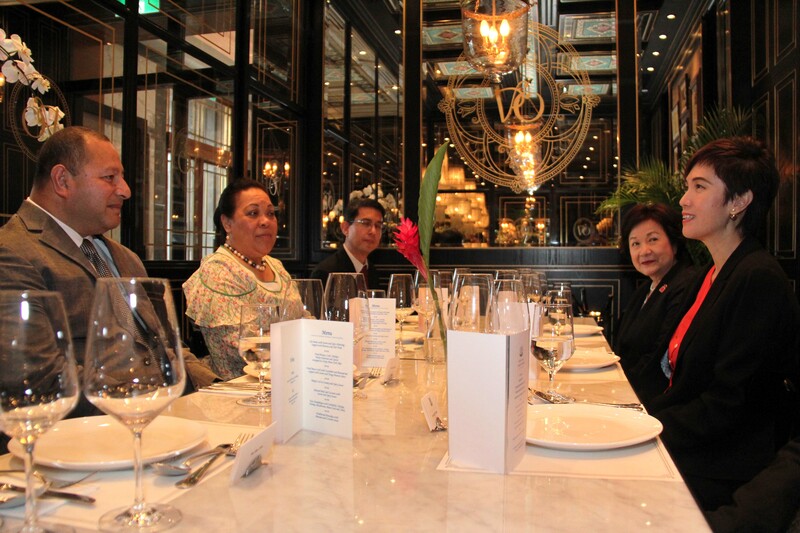 During his tenure as High Commissioner to Australia accredited to Thailand he witnessed first-hand the significant economic impact SEP has made to Thailand. While Thailand and Tonga are geographically distant, they share similar bonds; they are both a Constitutional Monarchy and are dependent on agriculture both for domestic consumption and international trade. 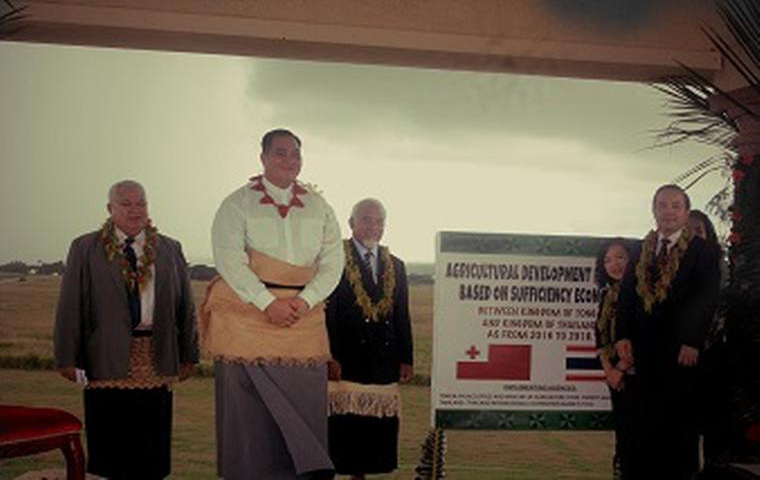 From His Majesty’s initial experience and initiative a technical cooperation partnership was established to implement the Royal Agricultural Development Project in Tonga based on Sufficiency Economy as a development model so that local people, in particular farmers will learn and apply the methods in their farming practises. In support of the project His Majesty donated six acres from his estate in Matakieua. During the seven day tour the participants visited four Royal Projects that promote the introduction of new crops, water conservation, preservation of forests, integrated farming practises, and production of local fruits and produce all aimed at sustainable development. These projects serve the immediate needs of the Thai people as well planning and providing for future generations. These projects have largely been achieved by conserving the environment and the restoration and reclamation of areas that have previously suffered misuse. The knowledge gained from the training is being applied directly to Tongan communities through the participants’ farming practises and the Royal Agricultural Study Centre in Matakieua. 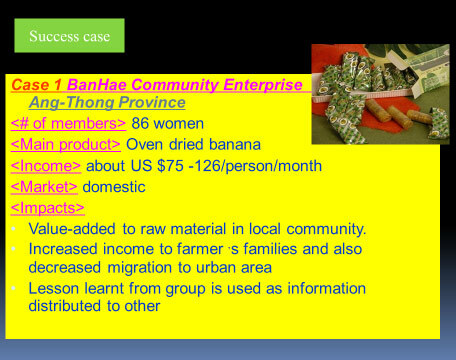 The following illustrates sustainable agricultural methods used in Thailand that can be easily applied in Tonga. Thailand’s home grown approach to sustainable development is a critical domestic agenda in its Government policies. The SEP Philosophy recommends that decisions and actions, at the individual, community and national levels be based upon reasonableness, moderation and prudence with clear virtues and knowledge. The Integrated Farming practice combines the best of modern tools and technologies with traditional practices according to a given site and situation. In simple words, it means using many ways of cultivation in a small space or land. The project goal in Tonga is to establish a learning center for sustainable development based on sufficiency economy that introduces integrated farming, multi cropping and agro farming systems. Hon. 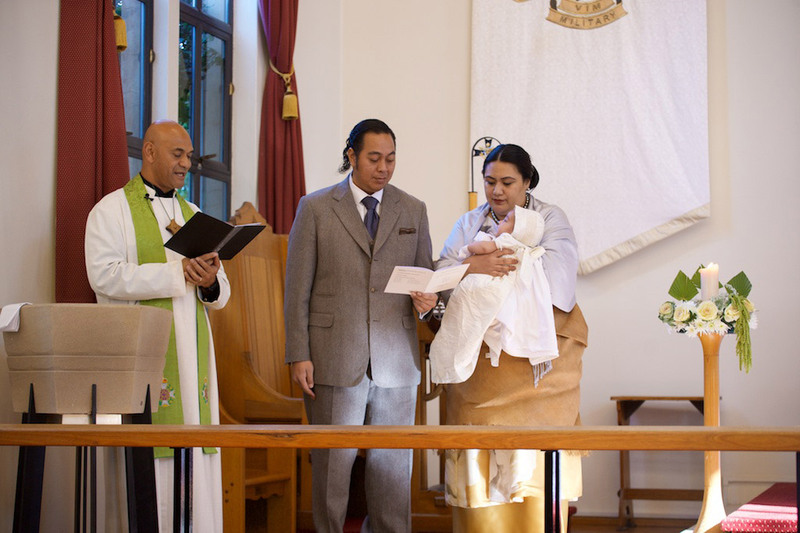 Sione Ikamafana Tuita, Lord Fakafanua, HRH Crown Prince Tupouto'a 'Ulukalala, Hon. 'Etani Tuku'aho and Hon. Fakaolameilangi Fakafanua gathered at the Royal Palace for a Sunday luncheon. The VOEA SAVEA's captain Navy Lieutenant (LT) 'Ametisi Fonokalafi said the multi-role vessel are also providing a critical link between the main islands and the outlying islands such as Niuatoputapu which are heavily reliant on the ferry service for transport and resupply of goods to the island. Queen Lavinia airfield, Niutoputapu's airport, receives flights once a month but is weather dependent. The same applies for the ferry service which only sends a boat when the cost of making the 40 hour boat trip can be covered. Medical evacuation are among the most pressing needs of the island. Tonga Navy assists the government by seizing every opportunity to get supplies and provide aid to affected people in hard to reach areas. News that the VOEA SAVEA was returning to Tongatapu via Vava'u was warmly received by the people of Niuatoputapu. Two would be mothers well into their third trimester of pregnancy, at 36 weeks were relieved that there was a means to travel to Vava'u to give birth. Niuatoputapu only has a health clinic with one nurse and a health officer, with very limited resources and very basic medical services. Prince Wellington Ngu Hospital a level 5 Trauma centre in Vava'u is the closest Hospital, it provides initial evaluation, stabilisation and basic diagnostic capabilities and prepares patients for transfer to higher levels of care. Dr 'Amone Vaka'uta, a General Practitioner at Viola Hospital who was returning on the Patrol Boat said pregnancy could be delivered in Niuatoputapu, however he advised against this as it is very risky. "It is very risky to perform deliveries in Niuatoputapu because we do not have the required equipment to ensure the mother's and baby's safety if there are complications" Dr Vaka'uta said. "I am very grateful that the Patrol Boat could assist in taking the patients to Vava'u as they were very close to their due date" Dr Vaka'uta said. Dr Vaka'uta further elaborated that the hospital in Vava'u can provide the care that is needed for the two pregnant patients and follow up care required. VOEA SAVEA also provide joy a family with an infant wishing to travel to Tongatapu. Also a group of 18 men of Niuatoputapu who have been waiting for over three weeks for transport to Tongatapu to head to New Zealand on the Seasonal workers scheme. Annually His Majesty travels throughout the Kingdom on both official and private visits to visit the Island groups. The intent of the royal visits are to witness first-hand the local conditions and different difficulties that are faced with the local inhabitants. So that long term solutions could be sought. Niuatoputapu was the first destination for 2017. Niuatoputapu is one of the northern most islands in the Kingdom, 600km from Nuku’alofa. All 1,300 inhabitants live in the three villages along the north coast. 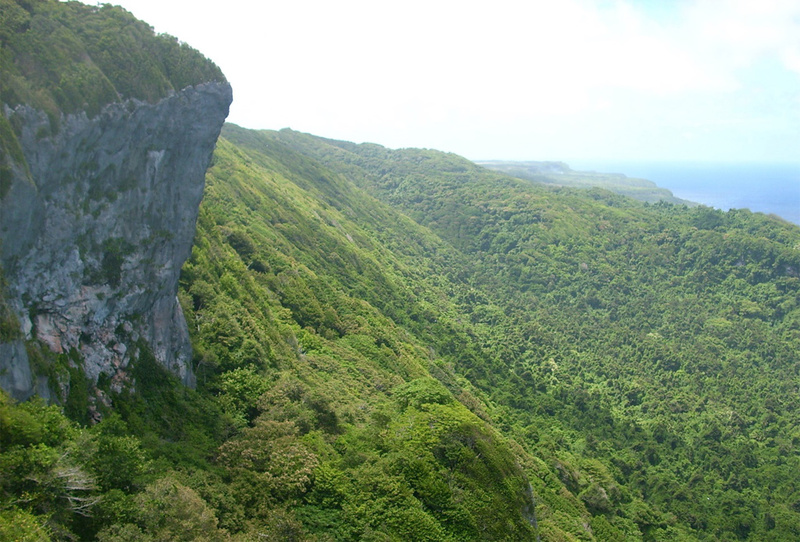 Its closest neighbour is the island of Tafahi a volcanic island standing at 560m high and when the weather conditions are right the mountains of Savaii (Samoa) can be seen from the peak o Tafahi. 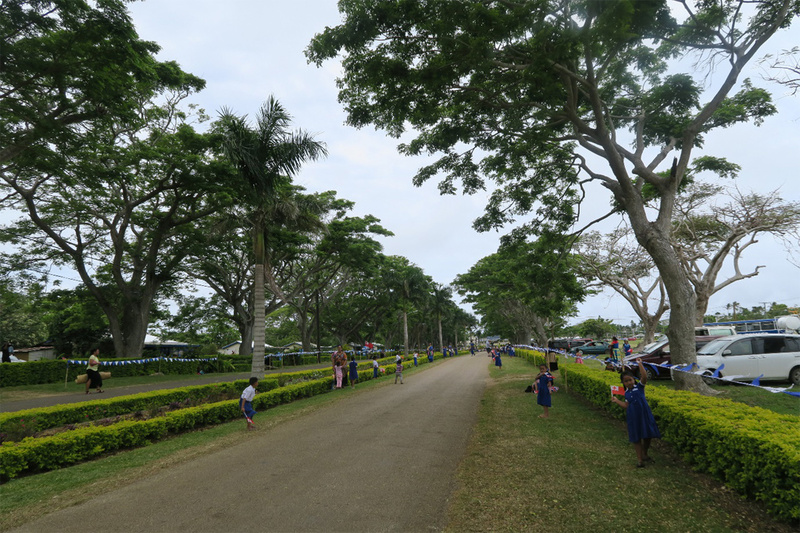 Niuatoputapu is geographically isolated from Tongatapu, the ferry service to the island only travels once a month or when the demand can cover the expenses of the ferry service. The last ferry that sailed to Niuatoputapu was the first week of February with the next scheduled ferry yet to be determined. His Majesty’s Armed Forces in support of His Majesty’s visit to Niuatoputapu provided the VOEA LATE, with the intend of sailing up North. 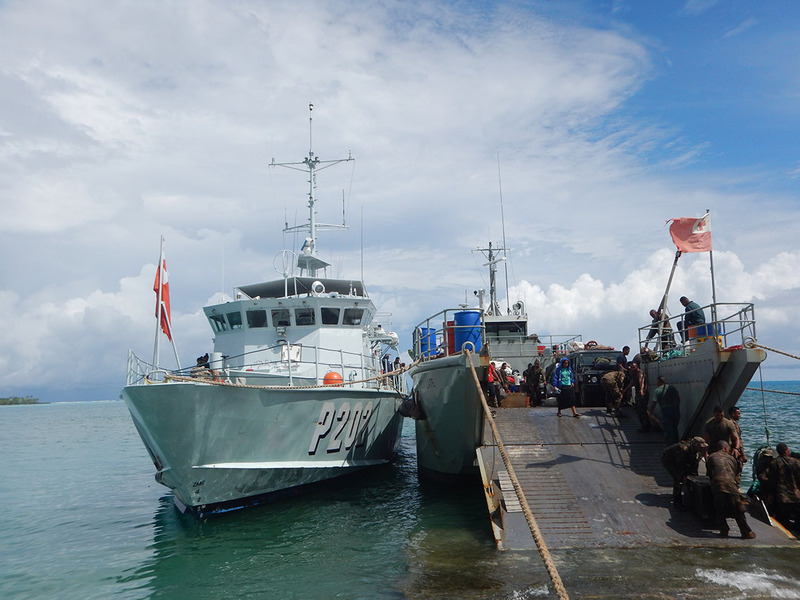 Tonga Navy has an ongoing commitment to Humanitraian assistance and Disaster relief in Tonga and at times assists the outer islands when the ferry service is unavailable. 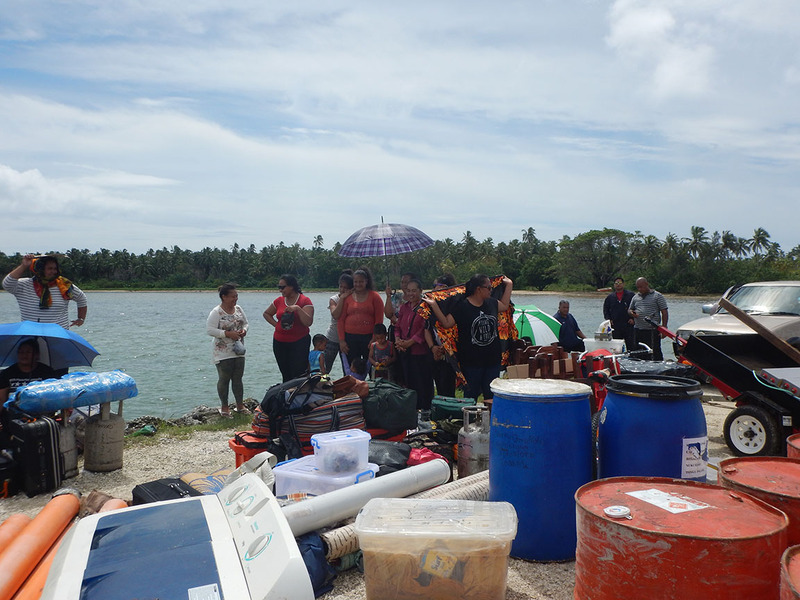 As news of the planned trip of the VOEA LATE was made known, family and community members associated with Niuatoputapu used this opportunity to travel and send goods as the next available ferry is undetermined. All available space on the VOEA LATE was utilised to take maximum cargo without sacrificing safety of the crew and passangers.Over half the cargo of goods were private belongings intend for relatives and people of Niuatoputapu. The VOEA LATE alongside Masefield Navy Base is being loaded by His Majesty’s Armed Forces personnel. Civilian onlookers observe as their cargo are being loaded for Niuatoputapu. Arriving at its destination, the VOEA PANGAI and VOEA LATE side by side, alongside Pasivulangi wharf, Niuatoputapu. The ships crew unloading the last of the cargo. 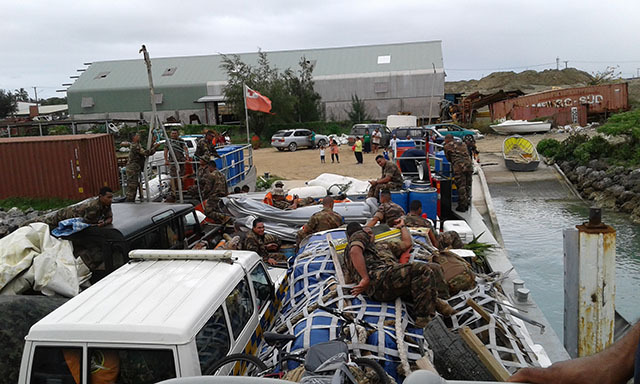 Cargo offloaded onto Pasivulangi wharf, as Niuatoputapu residents are overjoyed to receive goods from relatives in Tongatapu. As there is no regular ferry service, the arrival of the VOEA LATE with its cargo was welcomed. 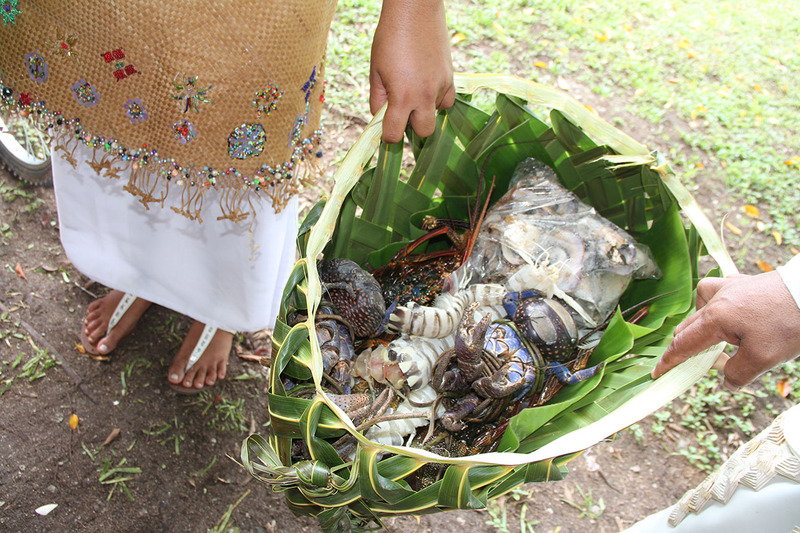 The delicacies of Niuatoputapu, pictured above are Mantis Shrimps, Lobsters and ‘U’u which are plentiful among other seafood. The Queen Mother’s great grand children HRH Prince Taufa’ahau and HRH Princess Mata'aho about to light the All Night Vigil fires outside the Royal Palace. I am to announce the demise of Her Majesty Queen Halaevalu Mata’aho The Queen Mother whom has been called to rest by the Almighty God. Her Majesty, The Queen Mother peacefully passed away on the evening Of Sunday 19th February, 2017 at 2215HRS, at the Auckland Hospital. Her Majesty, The Queen Mother will be brought home to the Royal Palace for the ‘Takipo’ Ceremony, on Tuesday 28th February, 2017. Henceforth Her Majesty, The Queen Mother shall be laid to rest on the morning of Wednesday 1st March, 2017 with the Worship Service at the Royal Tombs, Mala’e Kula. The traditional Royal 'Tapu' ceremony will be observed with mourning for a period of ten days. We are moved with profound sadness at the loss of the titled 'Kakala' whose essence has been the sanctuary and the fountain of love for the Royal House of Tupou. Ko hono talaki faka-pule’anga ‘o e pekia ‘a e Kuini Fehuhu, Kuini Halaevalu Mata’aho. Fakatapu ki he ‘Otua Mafimafi. Tapu mo e Hau ‘o e Fonua, Tupou 6. 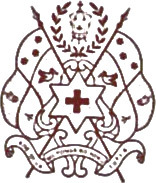 Tapu mo e tangata’i fonua mo e fefine’i fonua ‘o Tonga. Sapate 19 Fepueli, taimi 1015 po’uli. unga’anga pea mo e ‘ofa’anga ‘o e Fale ‘o Tupou. 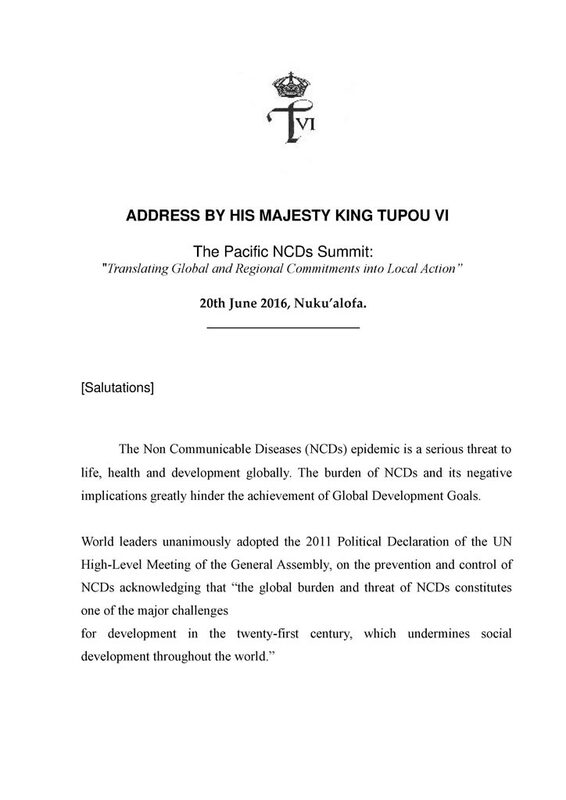 "Here in Tonga, I am pleased to state that we have put in significant efforts to ensure that NCDs is kept very much at the forefront of everyone’s agenda," he said. "NCDs have been specified as among the government’s priority areas for at least the past 15 years." 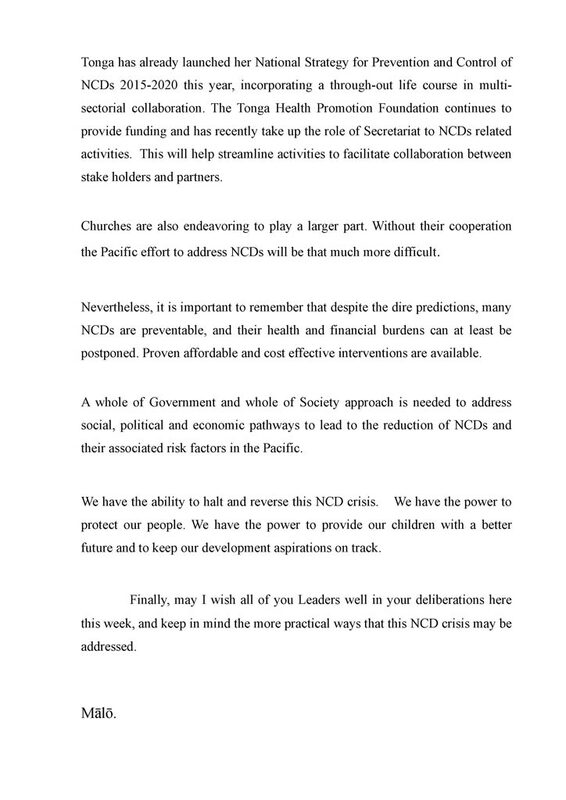 "The current Tonga Strategic Development Framework continues to prioritize NCDs and government leadership and support continues to be strong." "This is reflected by ongoing legislative and policy measures passed through Parliament as recently as a few months ago to help address NCDs related issues such as affordability of unhealthy foods and tobacco products." "The Tonga Health Promotion Foundation continues to provide funding and has recently also taken up the role of Secretariat to NCDs related activities. This will help streamline activities and facilitate collaboration between the different stake holders and partners." "I am pleased to share that the churches are also endeavoring to play their part. Many church leaders have shown strong leadership in making often unpopular decisions related to food given it’s an integral part of Tongan social and ceremonial events." "Forty percent of Pacific Islanders have been diagnosed with an NCD according to WHO in 2010, many before they have reached their fortieth birthday," she said. "Support from partners can be catalytic, and can supplement the capacity of governments themselves to commit domestic resources to NCD prevention and control." "Tonga, our host legislated for a Health Promotion Foundation Act nearly a decade ago." "You are all well-aware that the Pacific is often referred as the NCD capital of the world and that we are facing an NCD crisis," he said. "We have among the highest prevalence of NCDs and NCD risk factors in the world and feature prominently on a number of ‘Top 10’ lists that we would rather not be on. "At the end of the day, regardless of what challenges we may be facing as Pacific Islanders, the fact is between six and eight of every 10 deaths in the Pacific is from NCDs." During the tenure of HM King Tupou VI as High Commissioner to Thailand, he saw that the modern agricultural model based on Sufficiency Economy piloted by His Majesty King Bhumibol Adulyadej in Thailand in the 1970s, was suitable for Tonga. The technical cooperation and the model project that followed was initiated during his tenure as High Commissioner and followed up in 2014 by HRH Princess Angelika Latufuipeka in her current capacity as the High Commissioner to Thailand. 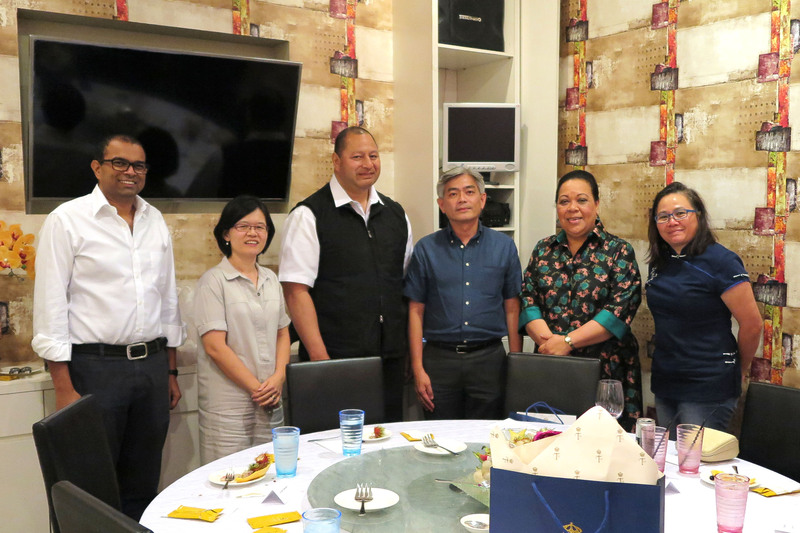 Following that two visits were made by high level officials from the Thailand International Cooperation Agency (TICA) meeting with Palace Office and Ministry of Agriculture officials. 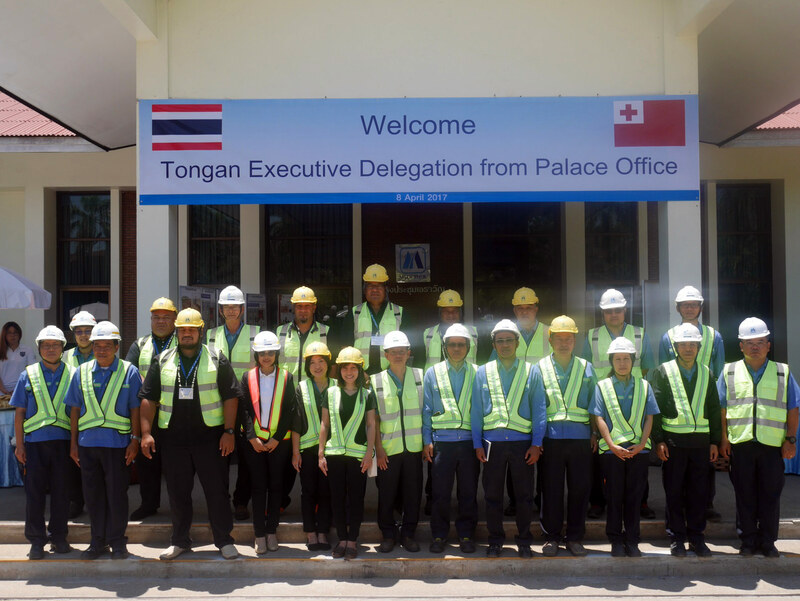 These visits laid the foundation and ground work for the launch of the pilot project on Agricultural Development Cooperation based on Sufficiency economy between the Kingdom [Tonga] and the Kingdom of Thailand. The project was officially launched in the presence of HRH The Crown Prince and the Deputy Director General Mr Singtong Lapisatepun, at the Royal Estate on 02 February 2016. The pilot project is to serve as a demonstration plot for sustainable agriculture development based on sufficiency economy. TICA will fund the project as well as to provide experts and training both in Tonga and in Thailand. The outcome of the pilot project is the establishment of a Learning Centre for sustainable development for Tongan farmers on land made available at the Royal Estate, Mataki’eua. Following that TICA arranged a study visit to Thailand under the Agricultural Development Cooperation Project for 11 Tongan representatives from 13 to 23 December 2016. The study visit provided the opportunity for participants to learn and understand the application of the Philosophy of Sufficiency Economy for Sustainable Development. During the visit they were taken to Royal Development Study Centres, multiple cropping farms and New Theory model agricultural farms, demonstration development projects and also conducted practical training. During the tenure of HM King Tupou VI as High Commissioner to Thailand, he saw that the modern agricultural model based on Sufficiency Economy piloted by His Majesty King Bhumibol Adulyadej in Thailand in the 1970s, was suitable for Tonga. The technical cooperation and the model project that followed was initiated during his tenure as High Commissioner and followed up in 2014 by HRH Princess Angelika Latufuipeka in her current capacity as the High Commissioner to Thailand. Following that two visits were made by high level officials from the Thailand International Cooperation Agency (TICA) meeting with Palace Office and Ministry of Agriculture officials. These visits laid the foundation and ground work for the launch of the pilot project on Agricultural Development Cooperation based on Sufficiency economy between the Kingdom [Tonga] and the Kingdom of Thailand. The project was officially launched in the presence of HRH The Crown Prince and the Deputy Director General Mr Singtong Lapisatepun, at the Royal Estate on 02 February 2016. The pilot project is to serve as a demonstration plot for sustainable agriculture development based on sufficiency economy. TICA will fund the project as well as to provide experts and training both in Tonga and in Thailand. The outcome of the pilot project is the establishment of a Learning Centre for sustainable development for Tongan farmers on land made available at the Royal Estate, Mataki’eua. Following that TICA arranged a study visit to Thailand under the Agricultural Development Cooperation Project for 11 Tongan representatives from 13 to 23 December 2016. The study visit provided the opportunity for participants to learn and understand the application of the Philosophy of Sufficiency Economy for Sustainable Development. During the visit they were taken to Royal Development Study Centres, multiple cropping farms and New Theory model agricultural farms, demonstration development projects and also conducted practical training. As the Commonwealth celebrates The Queen of England's 90th birthday, this year’s Award winner, Aiona Prescott, aged 21, has been recognised by The Queen for taking the lead in transforming the lives of others and making a lasting difference in her community. 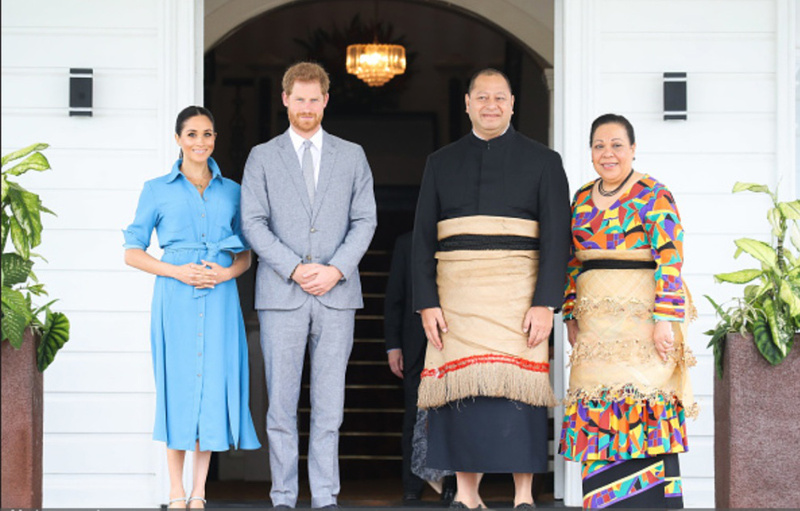 As a Queen’s Young Leader, she will be representing Tonga as she joins winners from 45 different Commonwealth countries in London for five days of high-level engagements, all designed to help them further their life-changing work.